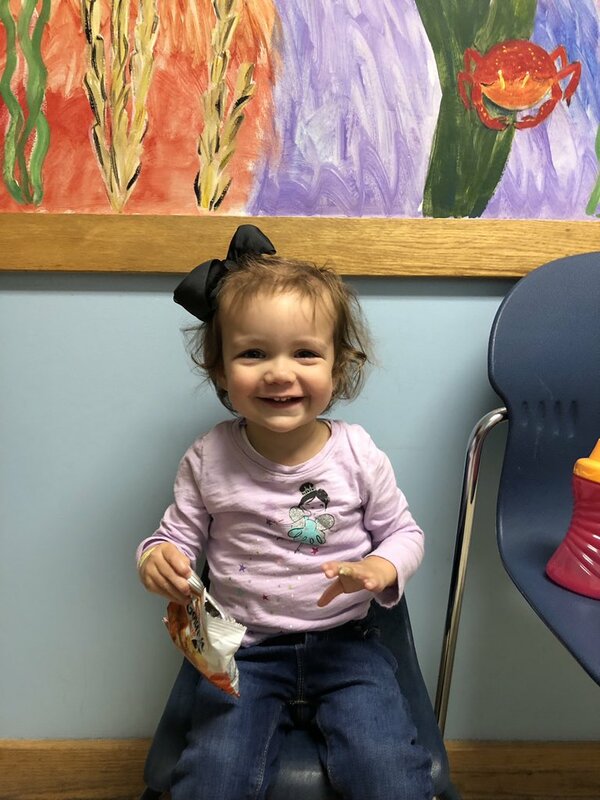 Healthy at 2 – Today, Sloan had her 2-year checkup. Although I couldn’t be there, Sid filled me in on the details. She tipped the scale at 24 pounds and measured 33 inches. Most importantly, she is a healthy little girl, something we don’t dare take for granted. Sloan’s pediatrician is Dr. Alfonso Sangtian of Coastal Pediatrics. 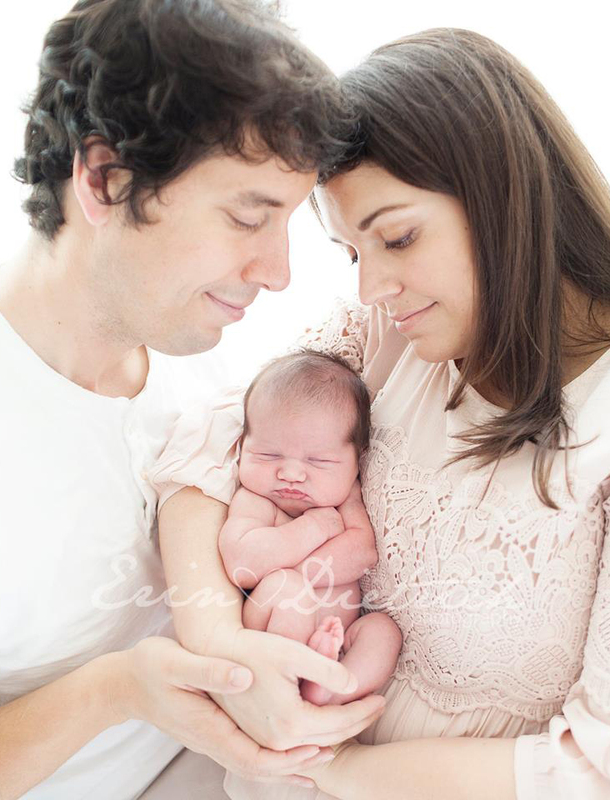 He was the doctor on call in the hospital baby nursery when Sloan was born. I am glad we went with our gut and made him Sloan’s doctor because he has helped her (and us) tremendously. Best of all, he is a doctor with values, ones we happen to share. If you are looking for a pediatrician, I recommend Dr. Sangtian. Sloan at the doctor’s office this afternoon. She sees Dr. Alfonso Sangtian of Coastal Pediatrics. Powerful Sentiment – Father David Nerbun, our chaplain at CCU and priest-in-residence at St. James in Conway, will occasionally quote Osacar Wilde in his homilies. The playwright once said Every saint has a past, and ever sinner has a future. Many saints, just like us, have done things in the past that they weren’t proud of. However, they were able to turn their lives around and become holy people. Wilde’s words apply to us in the grand scheme of life, but they also apply to shorter segments of time as well. We are now at the halfway point of Lent. Have you not lived up to what you intended to do during these initial few weeks of Easter preparation? Have you neglected to do anything at all? Don’t sulk. Instead, start preparing for the Feast of the Resurrection today. 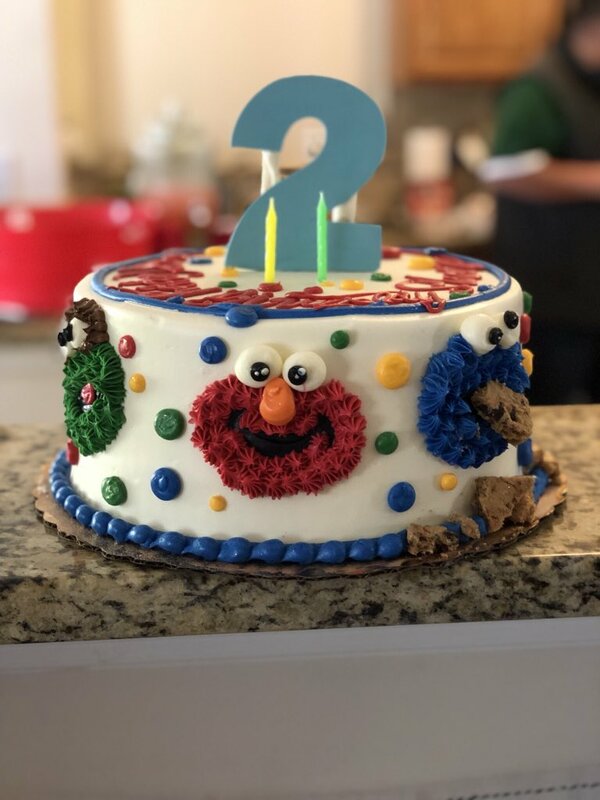 Oh TWOodles Birthday Party – A couple nights ago, I wrote about Sloan’s birthday party. I considered the event a success because Sloan had fun and it seemed as if our guests enjoyed themselves. Well, we recently went to another birthday party that was also successful. Last Saturday, we attended the birthday celebration of Sloan’s best friend, Jacqueline. 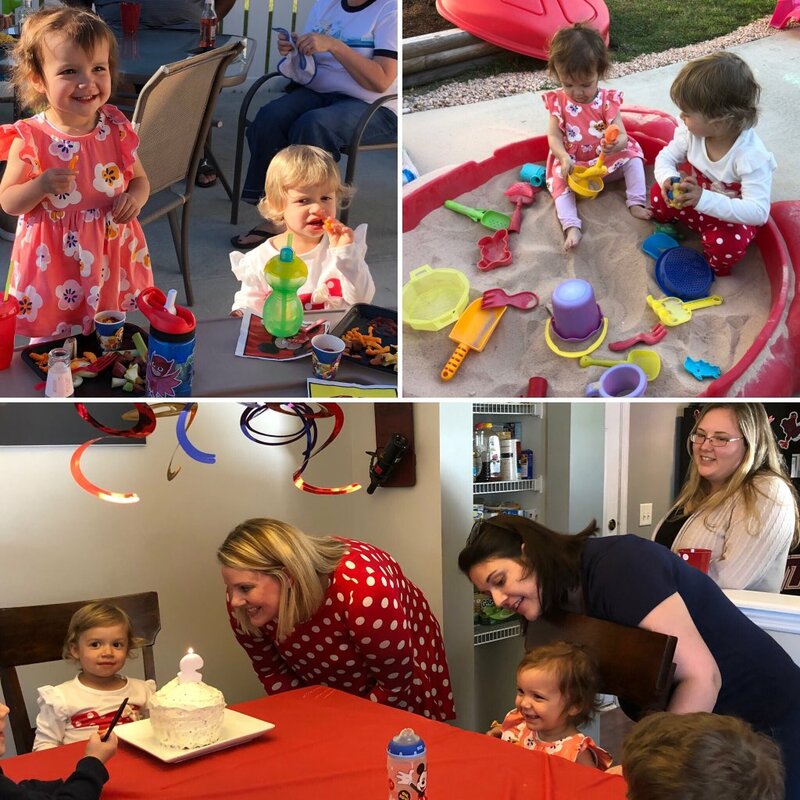 Her mom, Susannah, organized a Mickey Mouse-themed party that pulled out all the stops, including Mickey and Minnie ears for all of Jacqueline’s friends. She followed the theme to a T and put forth so much effort to make it a memorable experience. Sloan enjoyed playing on the jump house, digging in the sand box, and riding down a track made for toddlers. Jacqueline and her mama hosted an awesome party! Mueller Report – I think there were a lot of disappointed people with last weekend’s main conclusions from the Mueller Report. Those who despise President Trump and guaranteed that the report would contain bombshells were obviously deflated and embarrassed. Even those not hostile toward President Trump were a little let down by the findings, believing that all the time and money wasted on the report should have resulted in at least some credibility to the collusion allegations. 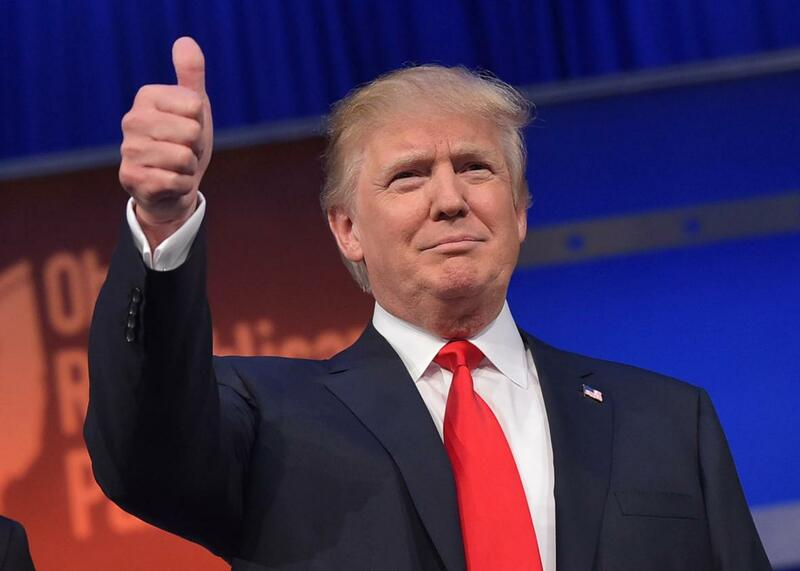 In the end, it is another big win for President Trump. As we are forced to watch him take his victory lap and smear the findings (or lack thereof) in the faces of his detractors, I think I must go back to what I wrote about over two years ago. We must do better. There has to be greater accountability by the national media to get things right and to be fair. We also can’t let hatred for a man get the best of us. Once again, President Trump got the last laugh. Archives – I have a couple memorable blog posts that I wrote on March 28 in prior years that I feel are worth mentioning. Two years ago, I wrote about my paternity leave. It was a beautiful time as I got to bond with Sloan and support Sid. It sure was hard to return to work. Three years ago, I wrote about the three main reasons why I enjoy YouTube. Since then, those reasons have changed a bit, but it is still worth a read. My paternity leave was spent bonding with my daughter and wife. Thank you for coming along for the ride! As March comes to an end, I want to wish a general “happy birthday” to all the great people we celebrated over the past four weeks. I don’t know what it is about March, but it seems like some of the best people were born during this month. Don’t Blink. Since living in Myrtle Beach for almost five years, my dad has visited me several times. Over the course of those visits, we have done just about everything there is to do in the area. However, during my dad’s most recent trip, a brand new option presented itself. One afternoon last week, we went to Topgolf. Ever heard of it before? With over 50 locations worldwide, it is referred to by the Myrtle Beach owner as “a driving range on steroids.” In my opinion, that description massively undersells it. 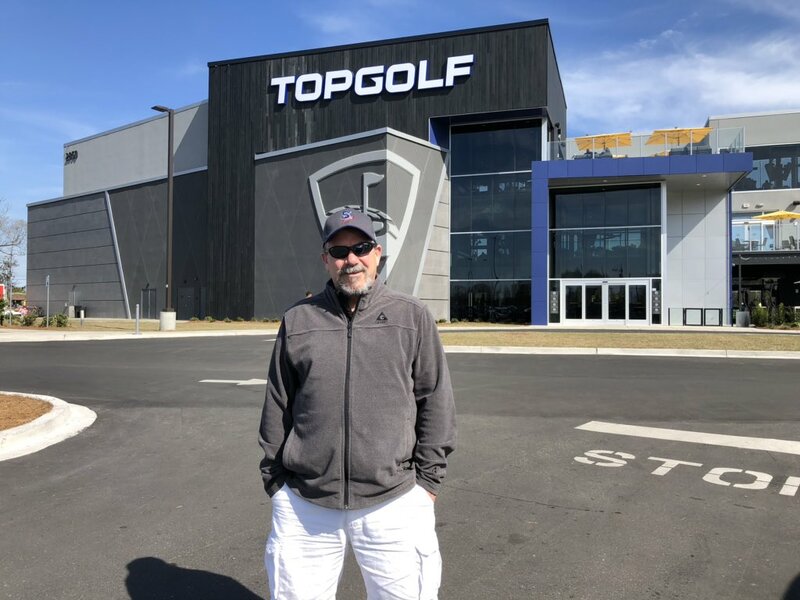 A photo of my dad outside of Topgolf in Myrtle Beach. 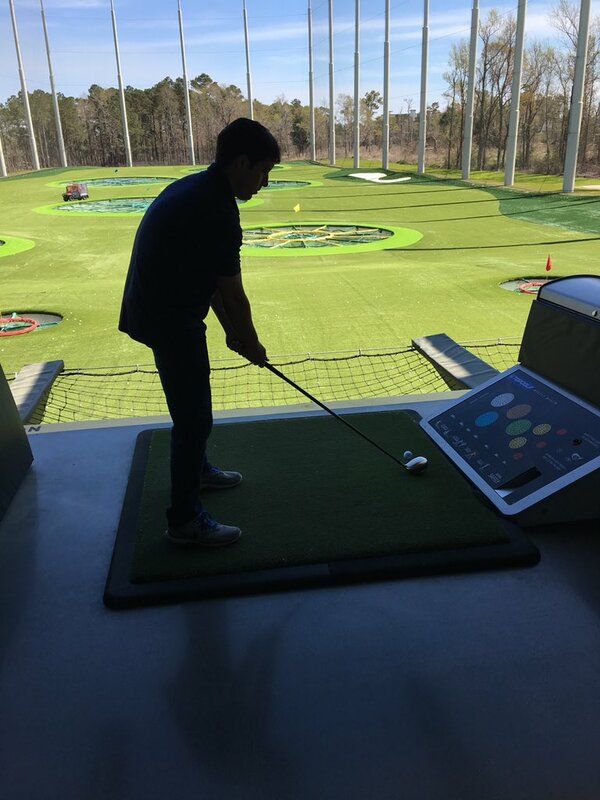 Topgolf is an enormous entertainment center that offers a high tech golfing experience. Customers hit golf balls out onto a 215-yard outfield, aiming to connect with giant targets that will earn them points. All balls have microchips in them to capture information that is relayed back to the customer who hit it. The game is played in an intoxicating atmosphere complete with club, sports bar, and bowling influences. Okay, enough with my sad summarization of the Topgolf concept. I think I can better explain what it is all about by just telling you about the experience that my dad and I had at the Myrtle Beach location. 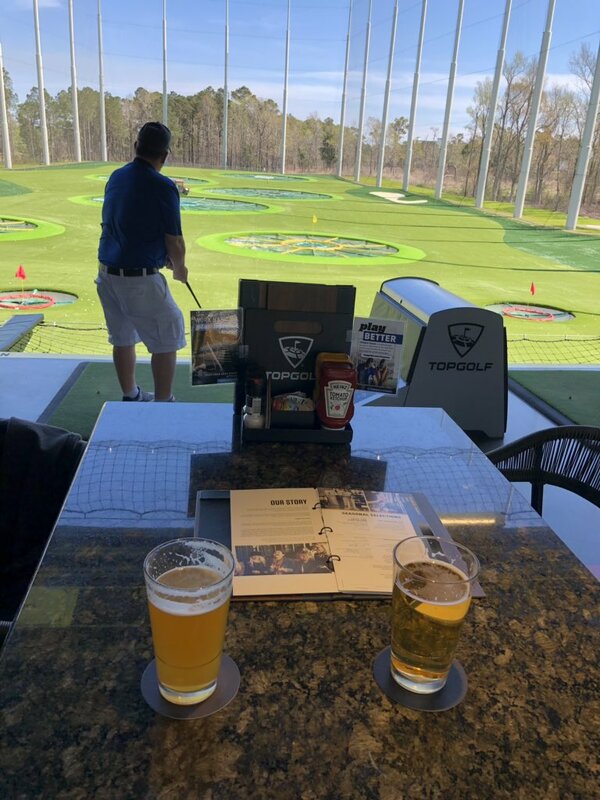 Just weeks old, Topgolf Myrtle Beach is in high demand. Sidney and I tried to play on a Saturday night and were faced with a three hour wait. To beat the crowds, my dad and I went on a late Monday afternoon. Not only did we save us the hassle of waiting but we saved money as well. Depending on the day of the week and the time of the day that you go, the hourly rate will fluctuate. For example, if Sid and I waited out the 180 minutes to play on that weekend night, we would have paid $47 for an hour. Since my dad and I played on a weekday afternoon/evening, we paid $35 for an hour. If I didn’t have to work and we went that morning, we would have only paid $25. The areas where you hit the golf balls are called bays. Each bay is taken care of by a host. Once we were assigned our bay, we took the elevator up to the second deck (oh, wait…I didn’t tell you? Topgolf Myrtle Beach has three different levels) where our host was waiting for us at our bay. She took time to explain the rules and playing options. This was very much appreciated because we were both pretty clueless on how everything worked. After her presentation, we were ready to let a rip! My silhouette teeing up to play Topgolf. It was so cool to hit golf balls while elevated above ground. I have always seen multilevel golfing ranges on TV and social media, but never actually played at one. Looking out over the deck and smacking a golf ball is fun! It took my dad and I few rounds to get comfortable with how the game and equipment worked, but the learning curve was short. Before long we were having a blast. Food and drink is a big draw at Topgolf. People go solely to order off the menu as many creative culinary delights are offered. Although we passed on food, we did order a couple rounds of beer. Served in heavy duty pint glasses, our beers were nice and cold. With the sun shining, good tunes playing, drinks in hand, and a beautiful golfing oasis in front of us, we really couldn’t ask for much more. 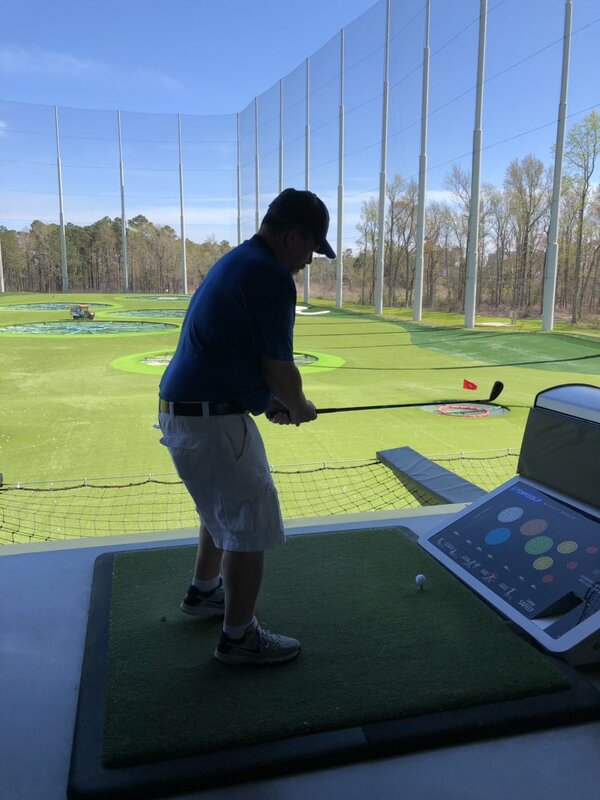 It was a picture perfect afternoon for Topgolf when we went to play. Golf clubs are provided and multiple screens keep score of the game and let you know how much time you have left to play. When you go up to hit a ball, you wave your club in front of a sensor and one is dispensed. Bays are climate controlled so you should never get too hot or too cold. When we were there, the facility was immaculately clean and our host was extremely attentive. It works like bowling. A frame or round is complete when each player has taken a turn. The game of Topgolf consists of 20 rounds. Because it was just my dad and I playing at our bay, we almost completed two games. I imagine that if a group of four played for an hour, it would translate perfectly to one complete game being played. My dad ready to let loose on a ball at Topgolf. After our time ran out, we went inside the second level and finished our beers in the bar area – not that we didn’t have other options. Throughout the three levels, there are multiple lounges and patios to dine. Large built in wall televisions span the entire three levels. It is an impressive setup and a paradise for sports fans. 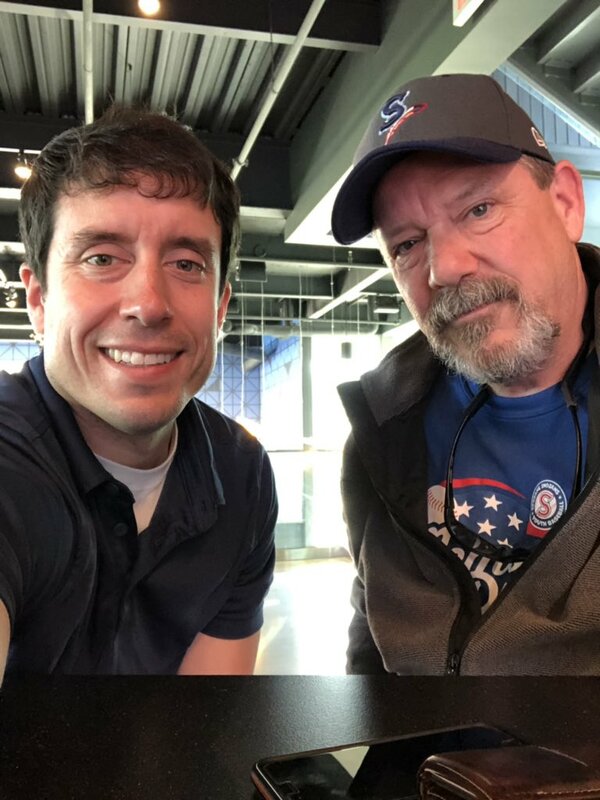 My dad and I inside Topgolf. I would describe Topgolf in one word: Atmosphere. While there, you just feel energized and engaged. If you want to do something unique and fun in a great environment, go to Topgolf for your next night out. Don’t Blink. We almost didn’t have an “official” party for Sloan. After last year’s extravaganza, Sid and I questioned whether to throw a bash for our 2-year-old. But, after thinking it over, we decided to pull one off! Realizing that you only turn 2 once, we went ahead and made plans. Selecting it out of a few contenders, Sidney decided to go with a Sesame Street theme. Sloan loves Elmo and Abby so we knew she would dig it. We went back and forth between having her party on Saturday, March 16, or Sunday, March 17 (her actual birthday), ultimately opting for the latter and setting a 2 p.m. start time. We would be hosting the party at our house. 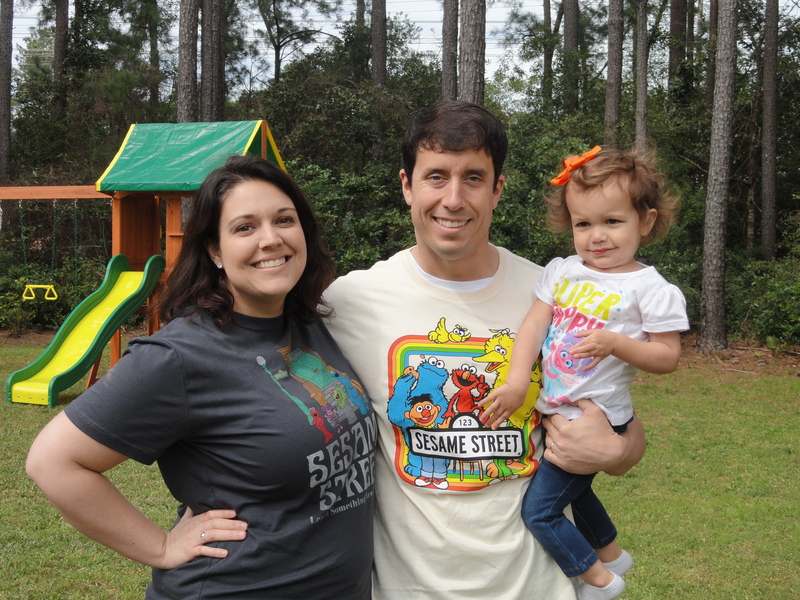 We threw a Sesame Street party and dressed the part. 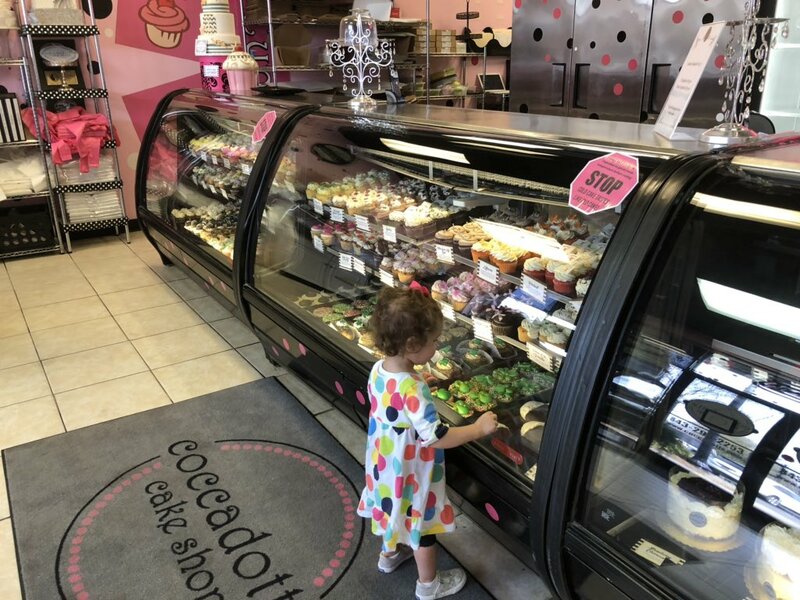 The weekend prior to her birthday, we picked out decorations and ordered the cake at Coccadotts. Sidney brought in a photo of how she wanted the cake to look and they responded by making us something even better. Thanks to Coccadotts for making a beautiful cake. Sloan “invited” a few of her best girlfriends (and parents) to be her guests of honor at the party. Sidney’s sisters, nephews, niece, brother-in-law, and a teaching friend also attended. Best of all, Sloan’s four grandparents were all there. By the time 2:15 p.m. rolled around, we had a total of 20 people in attendance. The majority of the party took place in the backyard. The brand new jungle gym that was fully constructed just hours prior to the bash was broken in by Sloan and her friends. But the shiny new addition to our backyard wasn’t the only source of entertainment. Thanks to Heroes for Hire, the attendees had a lot more to do. 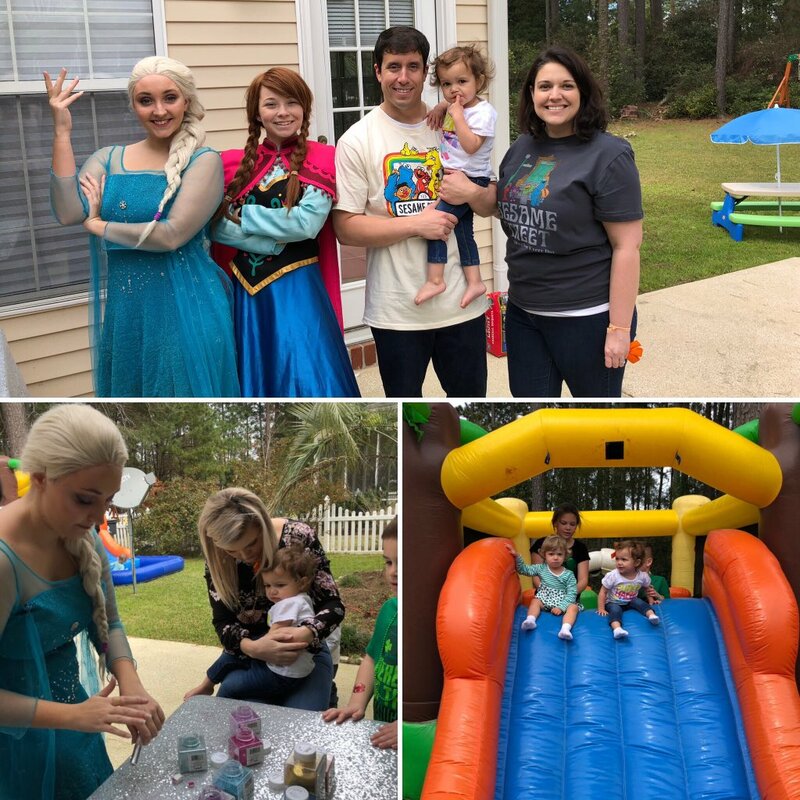 A bounce house was inflated, Anna and Elsa from “Frozen” made an appearance (making it 22 people at the party), and a glitter tattoo station was set up. 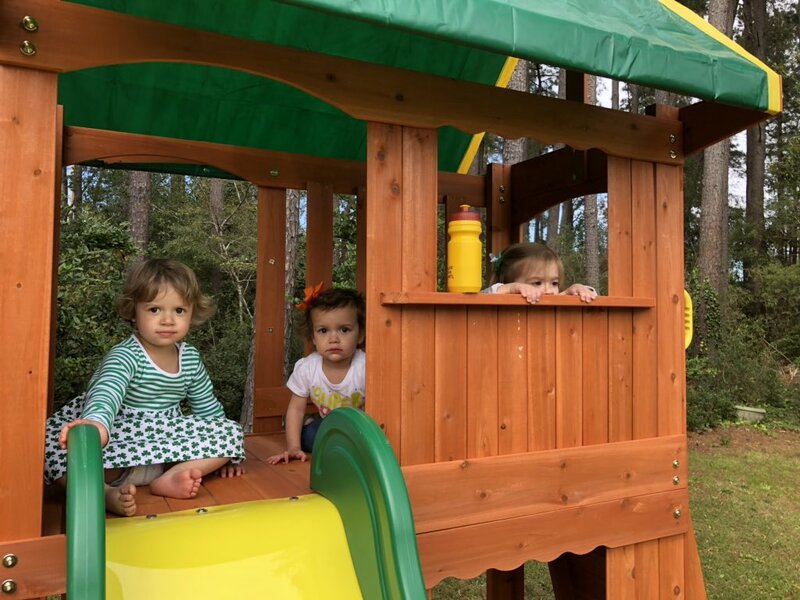 Sloan had a great time on her new jungle gym with Jacqueline and Stevie Blair. Let me tell you, if you need to add a fun element to your party, don’t hesitate contacting Heroes for Hire. The princesses were absolutely incredible! Not only did they play their parts perfectly but they showered Sloan with attention and did such a nice job applying the glitter tattoos to the toddlers who were brave enough (Sloan wasn’t) to get one. Heroes For Hire really made Sloan’s birthday party special. Highly recommend! The party eventually transitioned inside for lunch. 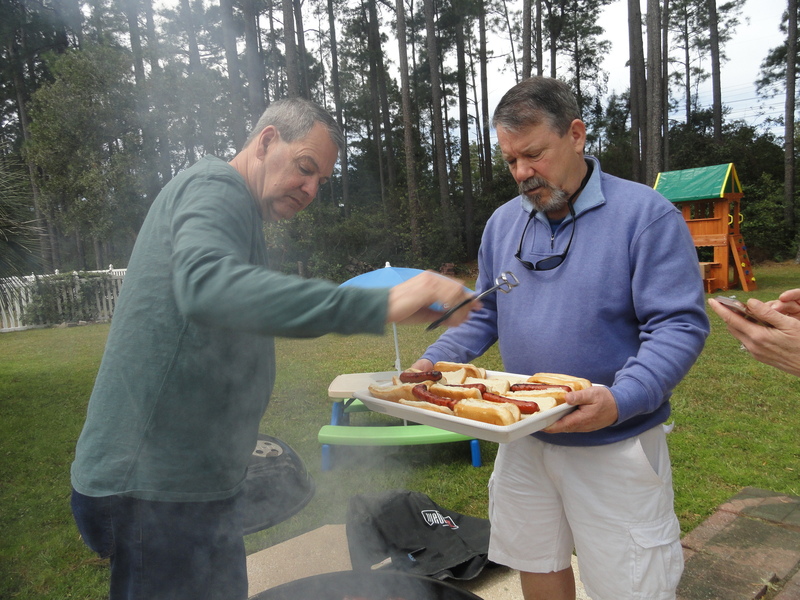 The grandpas grilled hot dogs that attendees could pair with various sides. People ate while enjoying the Sesame Street décor and the Sloan slideshow that looped on the living room TV. Sid’s dad (left) and my dad (right) worked together to grill hot dogs. It was now time for the signature part of any birthday party. With Sloan at the head of the table, we placed her birthday cake in front of her and everyone started singing. She immediately put her head down in what might have been a slight show of embarrassment. But any trace of uneasiness evaporated within seconds as a big smile spread across her face. Thanks to some assistance from her cousin, the candles were blown out and cake was served. Sloan happily blew out the candles on her birthday cake. After everyone finished with their cake, we moved forward with presents. Sloan was originally going to open them inside but it was such a beautiful and sunny afternoon that we took all the gifts outside. With everyone watching, Sloan tore open her presents. She couldn’t contain her excitement and started playing with some of her new toys right there on the grass. Sloan opening presents outside as her guests look on. The toddlers savored the final minutes of the party playing on the sun-drenched jungle gym and bounce house. As attendees left, we breathed a sigh of relief that everything went smoothly and that Sloan had an awesome time. Sloan and Jacqueline playing with Sloan’s new ice cream cart. Thanks to my wife for organizing the party and all the grandparents for helping us prepare for it. What a way to start Sloan’s next rotation around the sun. Don’t Blink. It has been almost a week since my parents left warm Myrtle Beach to return to, what turned out to be, warm Spokane (perhaps they brought the weather with them?). It was sad for us to see my parents go, and, even though my mom told me before the trip that “We aren’t coming to see you guys, we are coming to see Sloan,” I could tell by her misty eyes that saying goodbye to all three of us was hard. 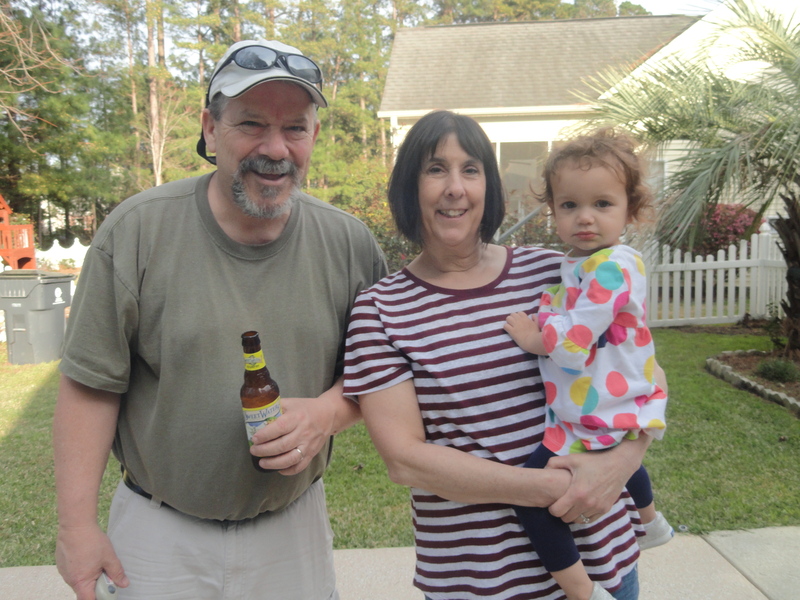 It was so nice to have my parents in Myrtle Beach with us earlier this month. My little family had such a great time with “grandma and papa.” Having both my parents for almost an entire week all to ourselves was refreshing and special. They both made sacrifices to travel across the country to be with Sloan on her birthday but they wouldn’t hesitate to say that it was worth it. For my recap blog post of my parents’ visit, I wanted to list 10 themes from a really great week. Sloan 24/7 – I knew my parents wanted to spend a lot of time with Sloan. However, I told them to consider taking at least a day to spend by themselves so they could explore Myrtle Beach or at least relax. They wouldn’t have any of it. 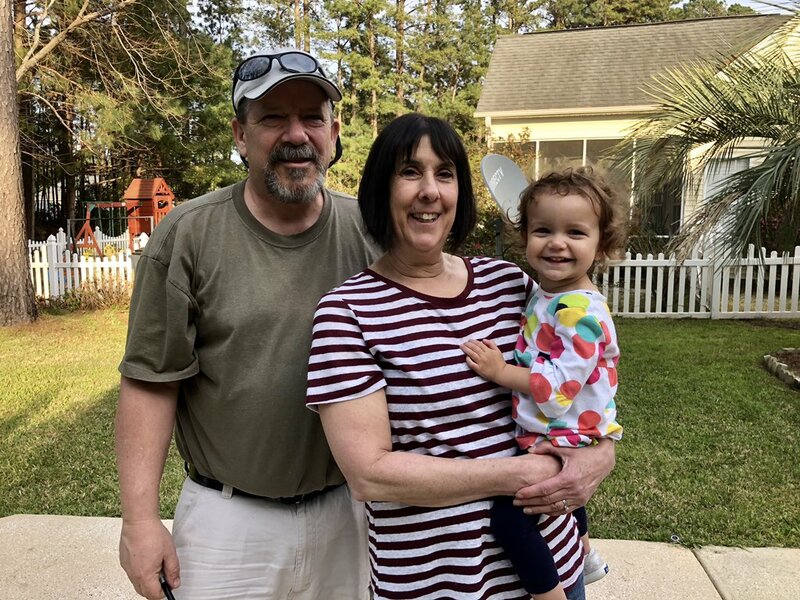 With the option of letting Sloan spend a couple of hours at daycare to take at least a quick breather, my mom passed on the offer and looked after Sloan every single minute she was in Myrtle Beach. My mom never let Sloan out of her sight. Home Cooked Meals – You all know how it is, cooking takes time and energy. It is even more complicated when both adults are following dietary programs. At the urging of my parents (and our appetites), we let them cook us delicious meals while they were here. By the time we were home from work, we had dishes waiting for us such as chicken alfredo and steaks. One night my mom put together a nacho bar for us to enjoy while we all watched “Green Book.” Then, to top it all off, before she left, my mom made her famous lasagna for Sid and I to enjoy later on in the week. My parents cooked delicious meals for us. 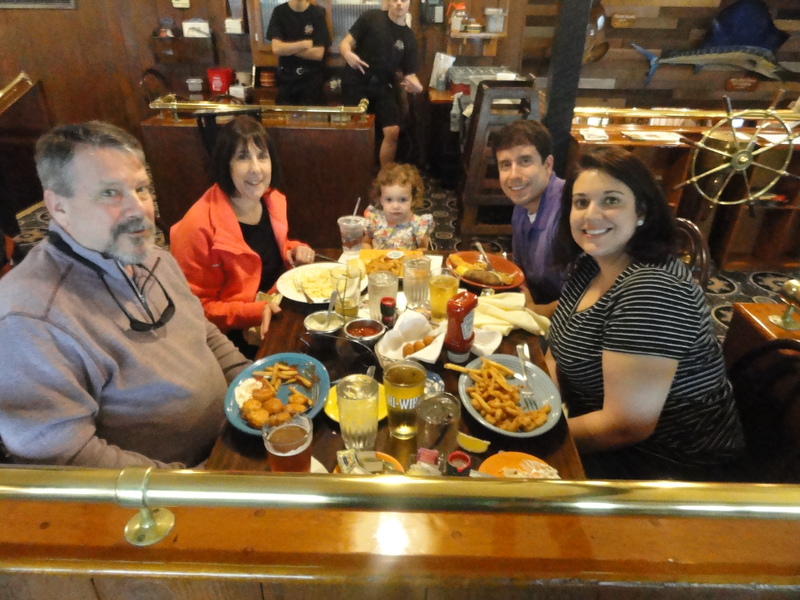 Meals Out on the Town – Even though I would have taken my mom’s cooking all week long, we also went out for some family dinners. We dined at Drunken Jack’s, the restaurant Sidney and I both count as our favorite in the area, on Friday evening. The final night they were in town, we ate at Longhorn Steakhouse, another one of our favorites. I even broke away for lunch one weekday and met my parents at Rotelli, an Italian restaurant in the CCU district. Always on their dime, my parents spoiled us. A photo of us enjoying dinner at Drunken Jack’s. 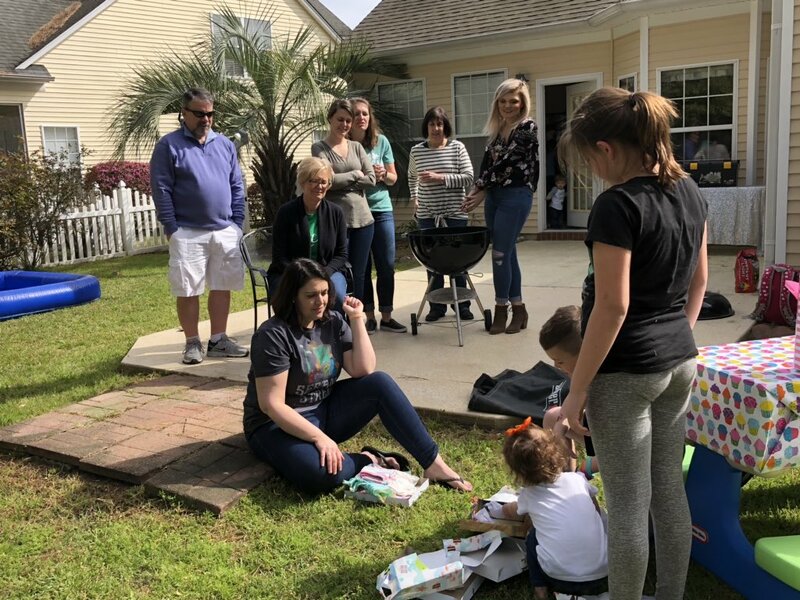 Build It and Sloan Will Come – As a joint birthday gift, my parents and Sidney’s parents went in together to buy Sloan a jungle gym for her birthday. Not only did they share the cost of purchasing it, they also shared the labor of putting it together. 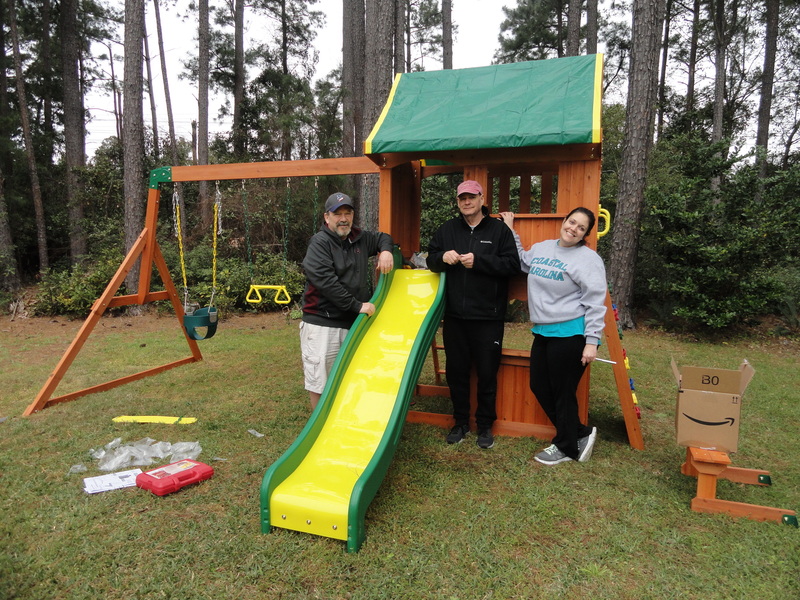 Sid’s dad, my dad, and Sidney worked long hours on Saturday and Sunday to build it so that it would be ready for Sloan’s birthday party that afternoon. They did an admirable job putting it together, a true showing of teamwork by the grandpas (and by Sidney). These three worked long and hard to put this together (I was Sid’s assistant). The Parade – On Saturday morning, my parents and I took Sloan out to North Myrtle Beach for the St. Patrick’s Day Parade. It is a tradition for my dad to take another one of his granddaughters, Mikayla, to the Spokane St. Patrick’s Day Parade so it was neat that he was able to share the ritual with Sloan. 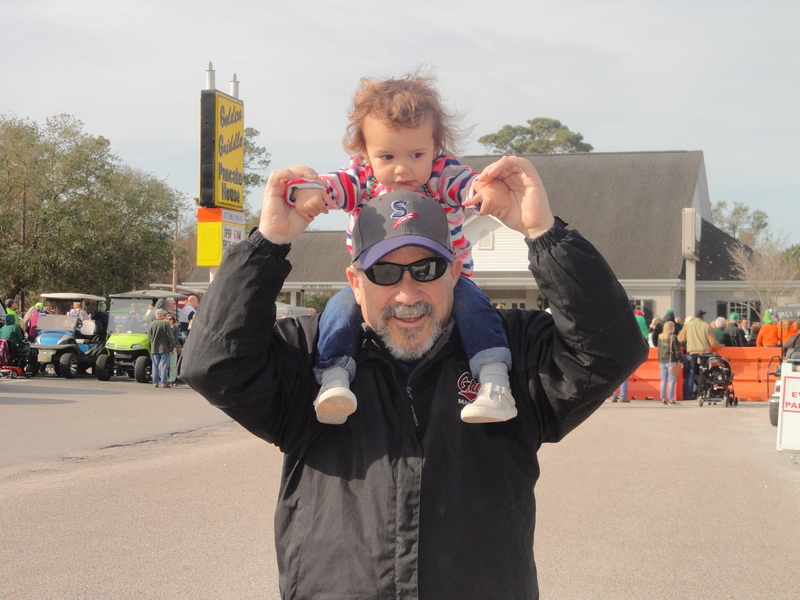 My dad and Sloan at the North Myrtle Beach St. Patrick’s Day Parade. Lawn and Laundry Service – While Sidney and I worked our jobs during the day, my parents were at our house doing what they could to help us out. My dad mowed the lawn, cleaned out the garage, and tended to other landscaping projects. My mom did laundry, washed dishes, and folded clothes. I guess they never got the memo that they were on vacation. My parents did a lot around the house for us. A Night Out for Mommy and Daddy – Sid and I rarely get the chance to go out on date nights. 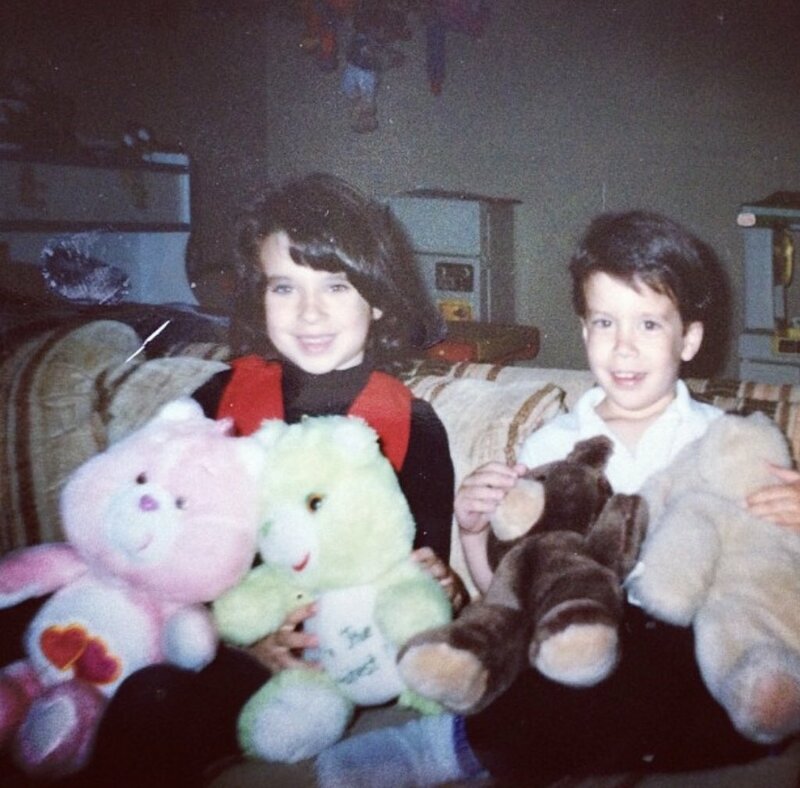 Long before my parents even packed their bags to visit us, they made it clear that the two of us were to go out at least once while they were there. Although we felt a little guilty leaving my parents at our house when we would have been perfectly content just visiting with them, we honored my mom’s orders and hit the town. Sidney and I enjoyed a nice dinner and then went to one of our favorite hangouts afterwards. While my parents were here, Sid and I got to enjoy a rare night out. Church as a Family – When we are in Spokane, it is always fun to attend church at St. Thomas More (church that I attended as a child). When my parents are in Myrtle Beach, it is always fun to attend church at St. Andrew. 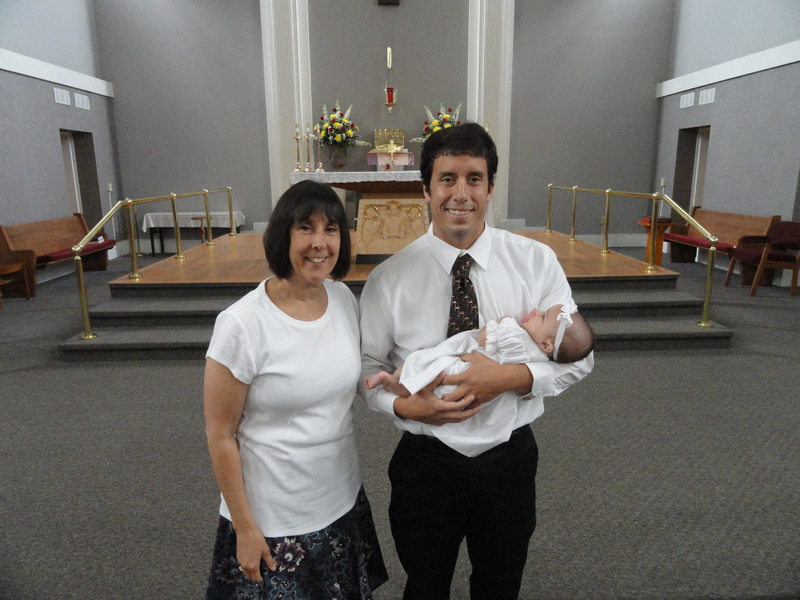 My parents, Sid, Sloan, and I worshipped at the 6:15 p.m. vigil mass on Saturday evening. It was the Transfiguration and the clergy member who baptized Sloan, Deacon Jones, actually delivered the homily! Although Sloan wasn’t on her best behavior, it sure was nice that all of us were together to celebrate the Eucharist during the Lenten season. My mom and dad returned to the church where Sloan was baptized. Sloan’s Birthday Party! – The main reason for my parents’ visit took place on Sunday afternoon. 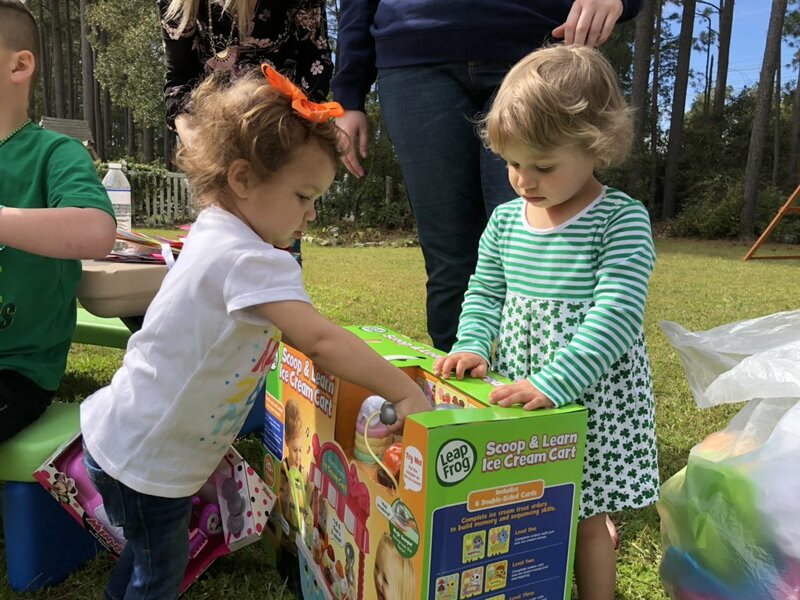 On a beautiful St. Patrick’s Day, they got to celebrate Sloan’s birthday at our backyard party. I know Sloan appreciated having all four of her grandparents in attendance. Speaking of those four grandparents, they all worked hard to prepare for the big party. 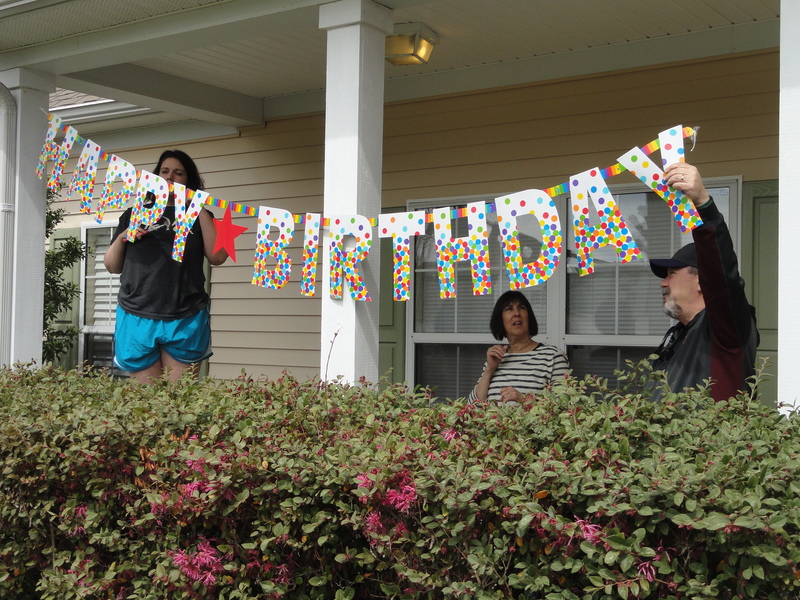 Sid’s mom and my mom ran all sorts of errands on Saturday and they helped decorate the house on Sunday. The grandpas of course put the jungle gym together and then grilled the hot dogs. It could not have turned out more perfect. 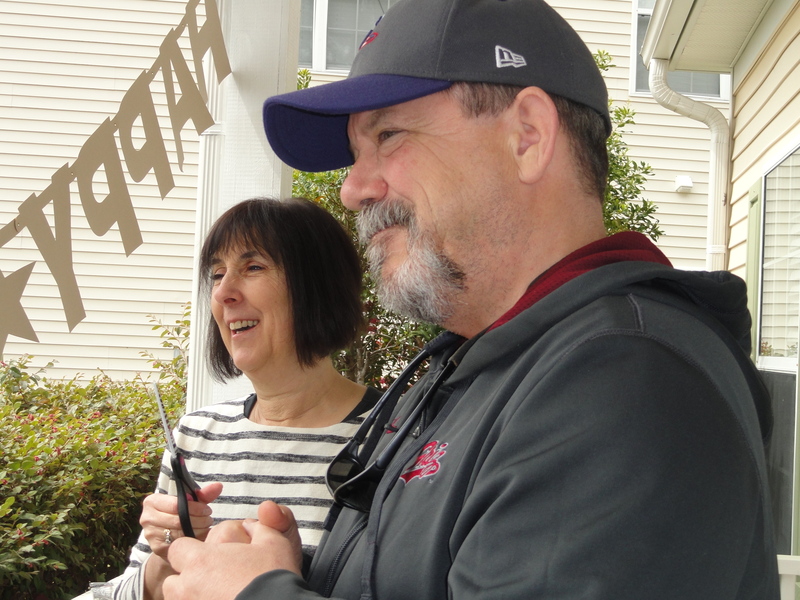 A photo of my parents helping to set up for the party. Waaalks for Daaayys – With beautiful weather during my parents’ time in Myrtle Beach, walks were aplenty. My mom and dad would take Sloan out in her mini pink car or just hold her hand and walk down the street. 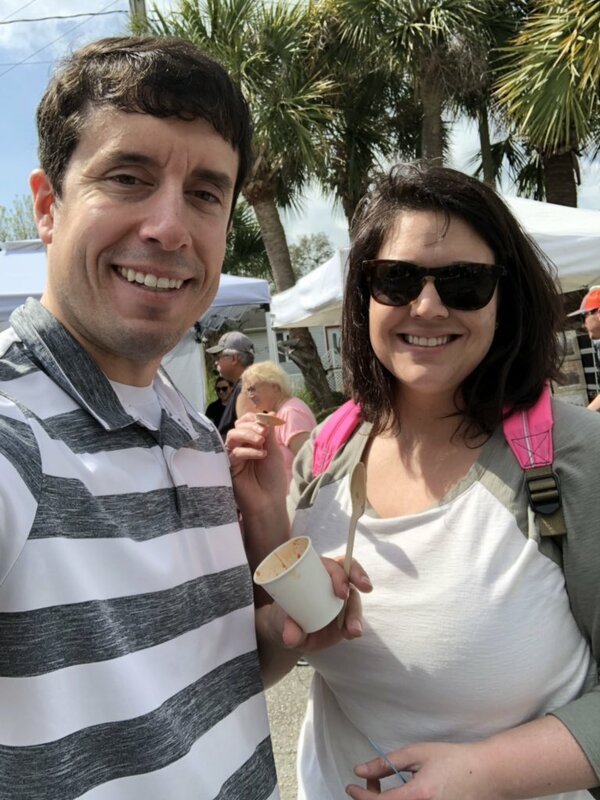 Whether it was going to the park in the neighborhood or strolling along the Marshwalk in Murrells Inlet, my parents and Sloan were on the move. Sloan burned lots of calories walking with grandma and papa. The best part of my parents visiting us was the love. By love I mean the reciprocity by which it was given by Sloan and my parents. 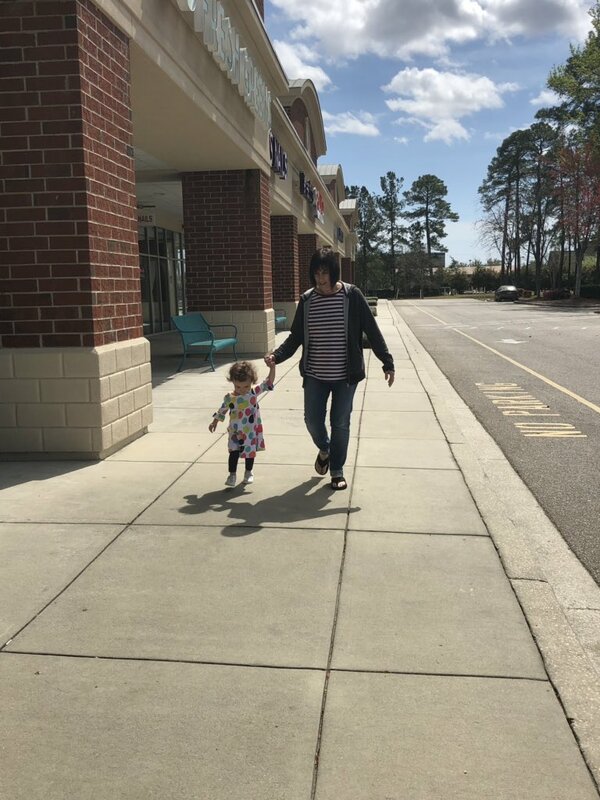 From the moment we picked up Sloan from daycare the afternoon her grandma and papa arrived, there was no mistaking the special bond that exists between them. Sloan was stuck to them the whole time they were here and my mom would make any excuse to spend an extra minute with Sloan (change a diaper, get her from the crib when she barely made a sound, sit in the backseat with her, etc.). We are missing grandma and papa a lot. It is sad that they are once again 3,000 miles apart. However, Sloan still calls out for her grandma and papa, she still lights up when they Facetime us, and she still shouts with glee when we point to a picture of them. So, despite the distance, one thing is for sure: The bond is as strong as ever. Don’t Blink. 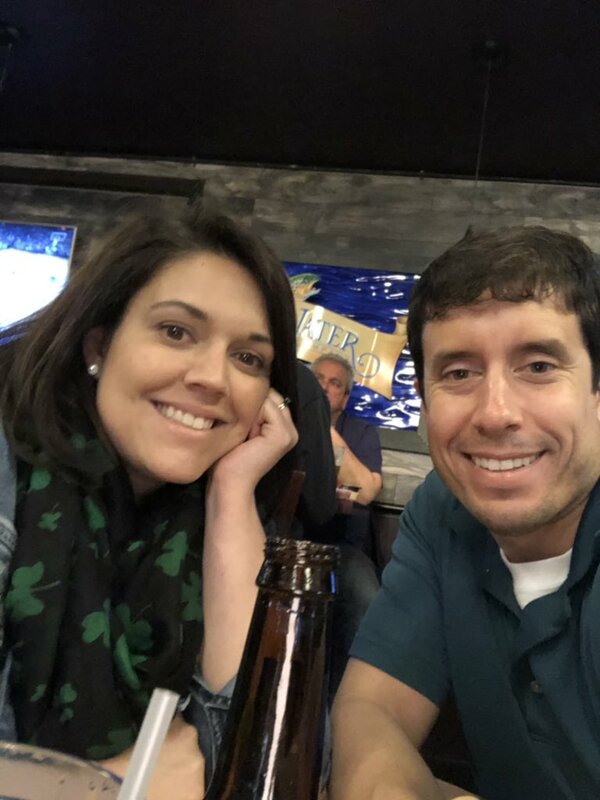 St. Patrick’s Day Fun – Because Sloan was born on St. Patrick’s Day, we have to celebrate accordingly, right? People remind us constantly that this will mean something else in about 19 years. 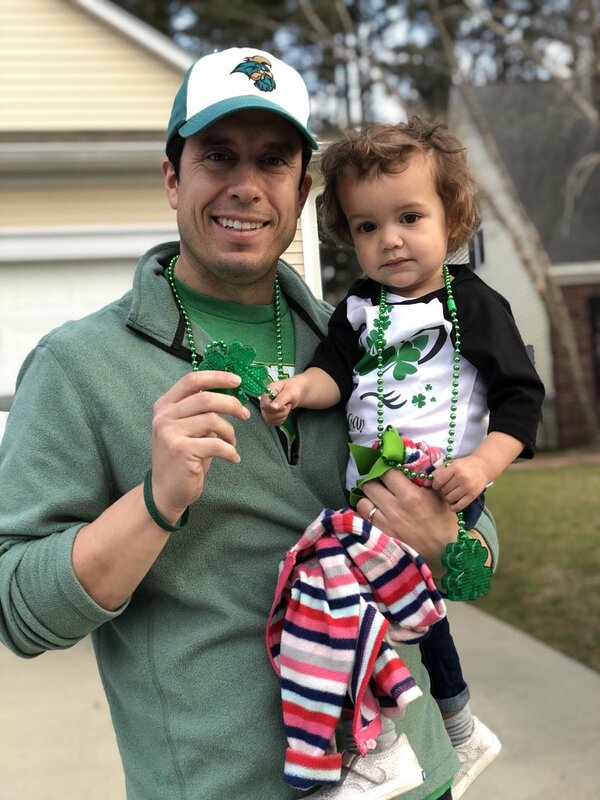 But for a 2-year-old, dressing up in green with her daddy and going to the local St. Patty’s Day parade is the wholesome way to do it. We went to North Myrtle Beach and enjoyed the Irish spirit and numerous floats. Sloan was good for the most part and perhaps we might make it a tradition. Sloan and I prior to leaving for the St. Pat’s parade in North Myrtle Beach. Changing Offices – A project in the making for about a year recently came to fruition this week. It was determined that it would make sense if all our University Communication media-based services were under one roof. 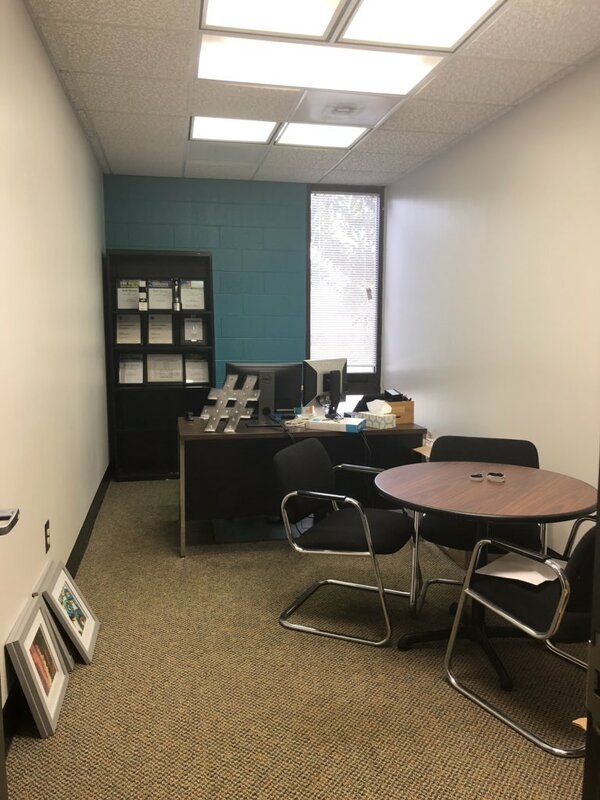 So, the photography department and social media department abandoned Laurel Hall and moved to join video production in Hampton Hall. All of us are excited for this arrangement. We already work so closely together that it feels great to now communicate by walking down the hall as opposed to making a phone call or sending an email. It also makes it much easier on campus constituents who now only need to go one place for their media needs. My office is a work in progress but I hope to spruce it up soon. I had the wall in the back painted teal! Excited to get my new office set up. World Down Syndrome Day – Today is World Down Syndrome Day. At Sloan’s daycare, they encouraged the children to participate in the #LotsOfSocks initiative that is associated with the day (you simply wear crazy socks). Whether you wore colorful socks or not, today is a good day to reflect on how we treat people with disabilities. All life is sacred, no matter if we have a physical or mental handicap. In society we need to treat people with disabilities, from the time they are in the womb to the day they die, with accommodation and compassion. 2019 NCAA Tournament – The Big Dance started in earnest today and I am happy to be along for the ride. I no longer watch it as obsessively as I used to, but I still follow it. I will be pulling for Gonzaga and Montana to keep winning until they would play each other in the Elite Eight. This is a great time of the year and I hope plenty of memories are made (although how do you top a #16 seed beating a #1 seed like last year?). 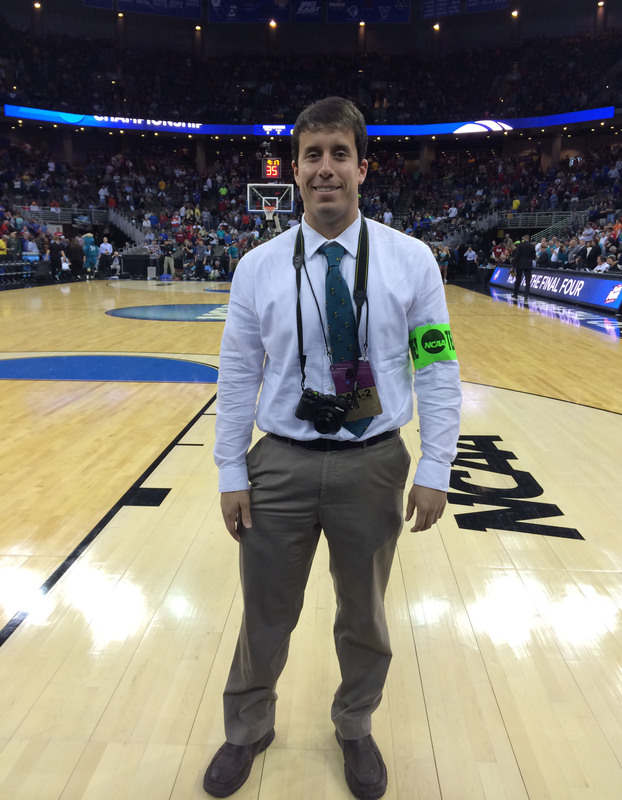 In 2015, I traveled with the Chanticleer men’s basketball team to the NCAA tournament. I won’t be at a site this year, but I hope to watch some of the tournament on TV. Throwback Photo – I thought I would sneak in a retro photo to end today’s rundown. This is me with my sister. We are having a stuffed animal party, much like the ones Sloan enjoys. I want to say that this might have been prior to a themed day at school based on the book “Teddy Bears’ Picnic.” I wonder if any of those bears in this photo are still around? What do you think, mom? Chilling with our teddy bears. I am looking forward to a quiet weekend. Whether yours is low key or hectic, I hope it is at least enjoyable. I will catch up with you all next week. Don’t Blink. Good evening! I hope everyone is having a great week so far. 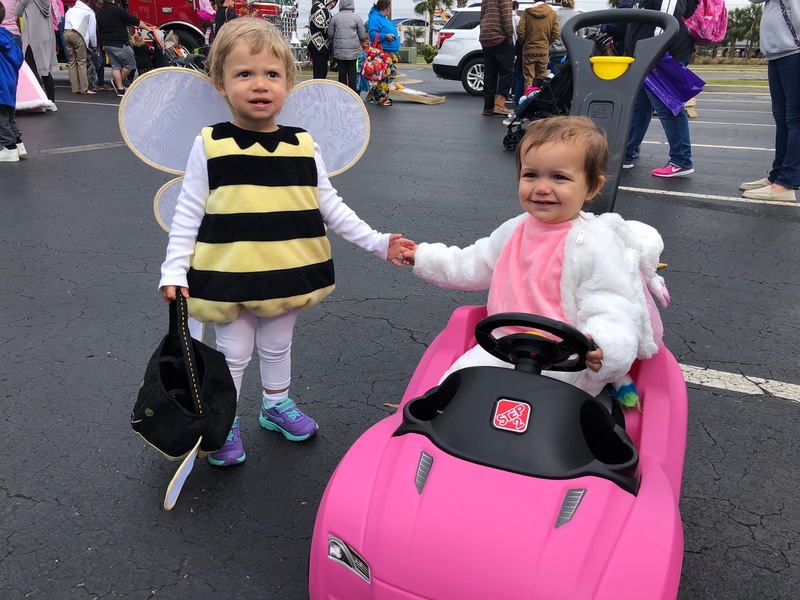 I wanted to quickly check in with my readers and explain why I haven’t written since this Sunday when I published Sloan’s birthday post. Things have been BUSY and I have been a bit exhausted. My parents recently wrapped up their visit and plenty is going on at work including an office change. Add to that a string of late nights and early mornings and I am finding myself playing catch up – both with sleep and extracurriculars, such as my blog. However, things will eventually slow down and my fatigue will subside. At that time my blogging juices will be flowing and I will be publishing content, which is a good thing, because I have a lot to write about! Next week expect pieces on my parents’ visit, Sloan’s birthday, and my experience at Topgolf. But you might not have to wait that long! There is a chance I might mess around and write a Thursday Rundown tomorrow. You will just have to wait and see. Thanks for your continued support of this blog. Don’t Blink. Today my little girl is 2. How did 730 days go by so fast? As I reflect on the latter 365 days of her life, I think I can sum it up this way: Gosh that was fun! 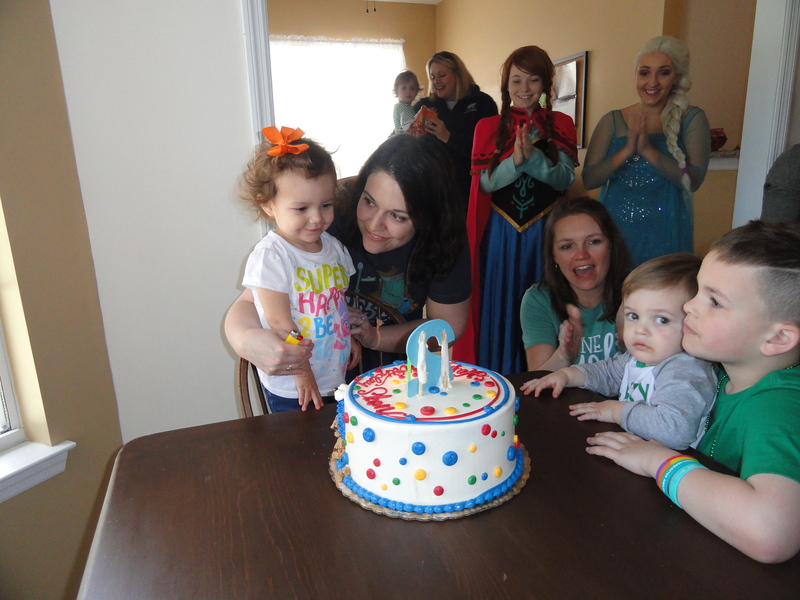 Sloan started off her time as a 1-year-old with a birthday party surrounded by friends and family. A look at Sloan and myself (notice the same shirt) on March 17 in 2019, 2018, and 2017. First, her intellectual capacity increased greater than I could have imagined. 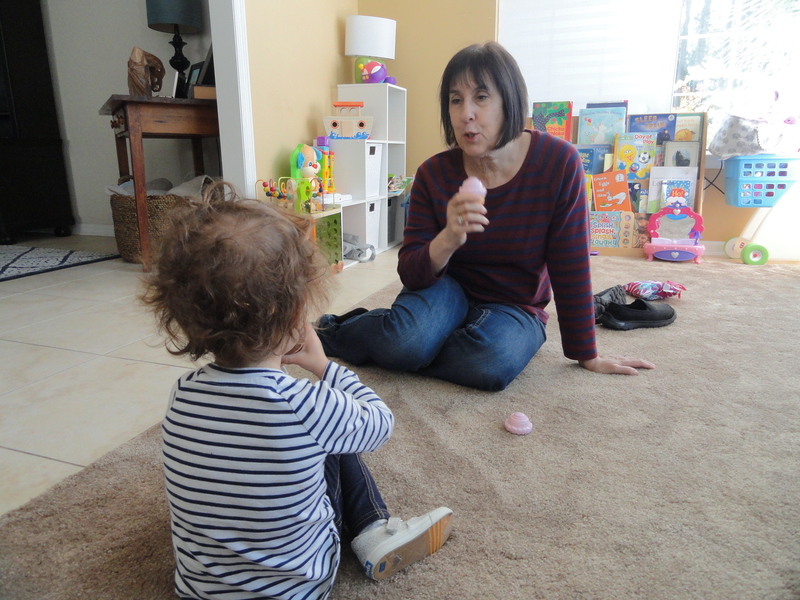 From saying basic words like “dada,” “mama,” and “bye bye” when she turned 1 to now talking our ears off, her vocabulary and reasoning skills soared. Our little girl now says the alphabet, sings songs, and recites prayers. Her daycare teachers, grandparents, and people at church marvel at her abilities. Over the past year, at the end of each day, Sid and I would swap notes on something new she did. It was neat to watch her progress and observe the wheels moving in her head. It has been a great year for Sloan and our family. Second, and most rewarding, has been watching her express emotions. Sloan is loving. She makes Sidney and I feel like the most important people in the world when we walk into a room. She melts our hearts when she says “I love you, daddy/mommy.” She changes our entire day for the better when she gives us a random kiss. She energizes us when she runs from 20 feet away to give us a hug. She is affectionate and sweet, attributes I am trying to cherish, because I know the degree to which she worships us in the present won’t always be the case in the future. Her capacity to love, so passionately demonstrated over the past 52 weeks, has challenged us to love even greater ourselves. Thanks for the laughs this past year, Sloan. It has been a good year for Sloan. She has stayed healthy and prospered at her daycare. She has played hard during the day and slept well at night. She has become attached to a couple stuffed animals but also developed friendships with little girls and boys. She loves books but has discovered the magic of iPads and iPhones. She enjoys hamburgers, fruit snacks, pasta, and bananas but can be extremely picky at dinner. She has proven that she can sit still but prefers to be untamable 95% of the time. Sloan has made many friends throughout the year. This is her with her best friend, Jacqueline. Sloan’s time as a 1-year-old contained some highlights. She visited Disney World. She flew back-and-forth across the country…twice. She moved houses, changed daycares, and grew in all her teeth. 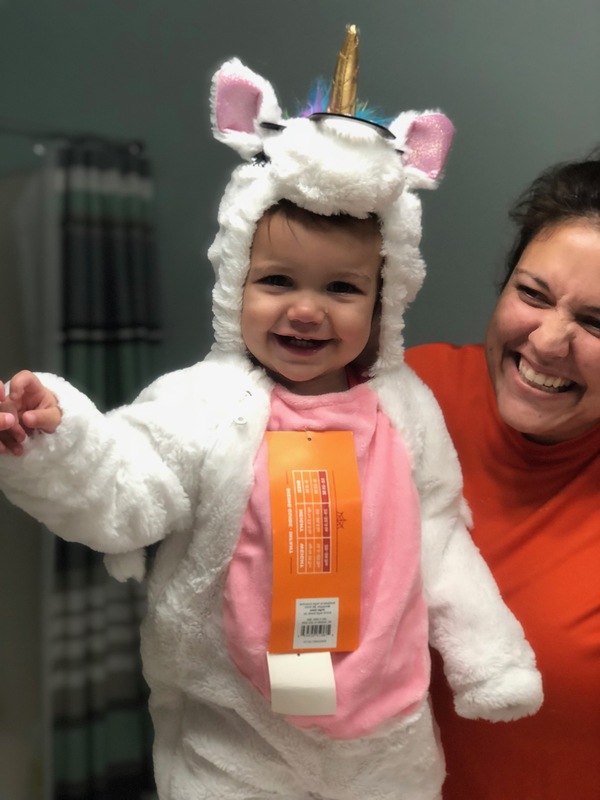 She attended an air show, dressed up as a unicorn for Halloween, and played on jungle gyms across Myrtle Beach. She visited the zoo, “bowled” at the bowling alley, and encountered marine life at the aquarium. She ate at Chick-fil-A for the first time and developed a love for McDonald’s hamburgers. Aside from bugs that affect all toddlers, she stayed healthy and met all benchmarks for growth. 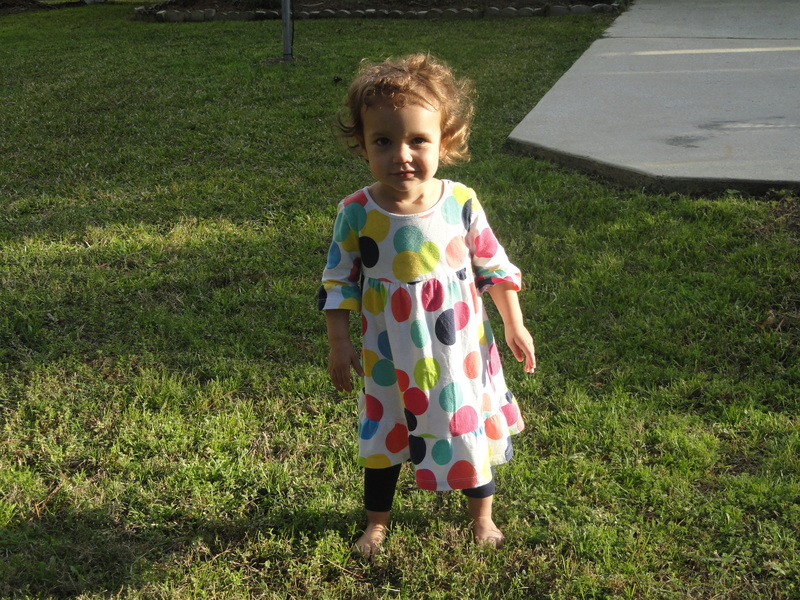 As evidenced by the first photo in this blog post, Sloan has changed physically quite a bit in the past year. However, her sweet heart she was born with still has not changed. This past year, Sloan lived with happiness, curiosity, and love. She continued to endear herself to those around her. She gave Sid and I countless proud parent moments and always started and ended our day with a smile. Today we celebrate Sloan’s second birthday. We will look forward to the “terrible two” year but also reflect on what was a very special past 365 days. Sloan, your mommy and I think the world of you and are very proud of you. Happy Birthday!! Don’t Blink. 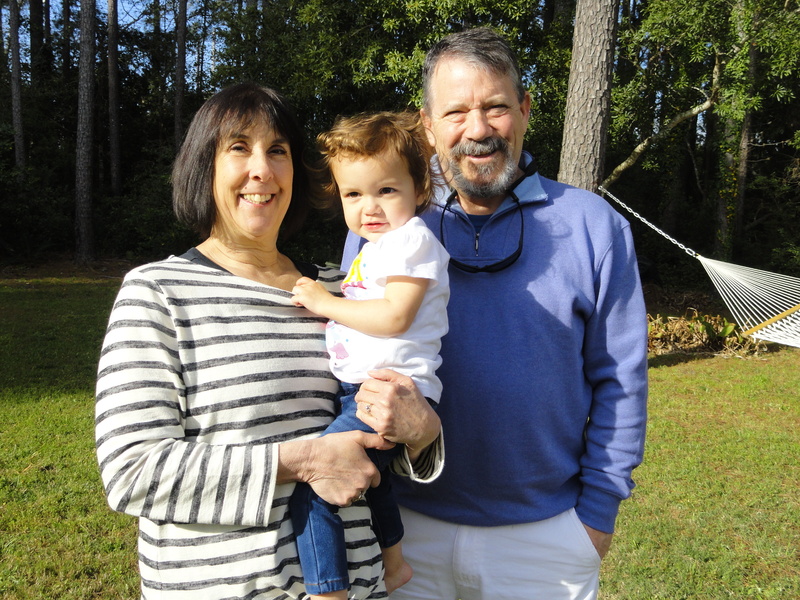 Parents in Myrtle Beach – This year, my mom and dad selected Sloan’s birthday weekend to make their annual trip to Myrtle Beach. My parents arrived yesterday afternoon and are blown away by Sloan’s development just over the past few months. 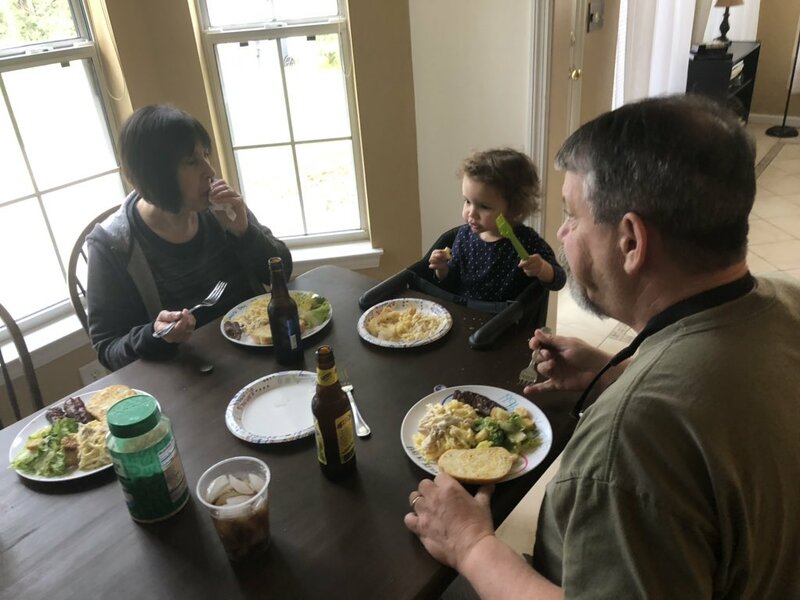 Saying their goal is to spend time with their granddaughter and give Sidney and I time to spend together, we are so thankful that “grandma and papa” are here. My parents with Sloan tonight. 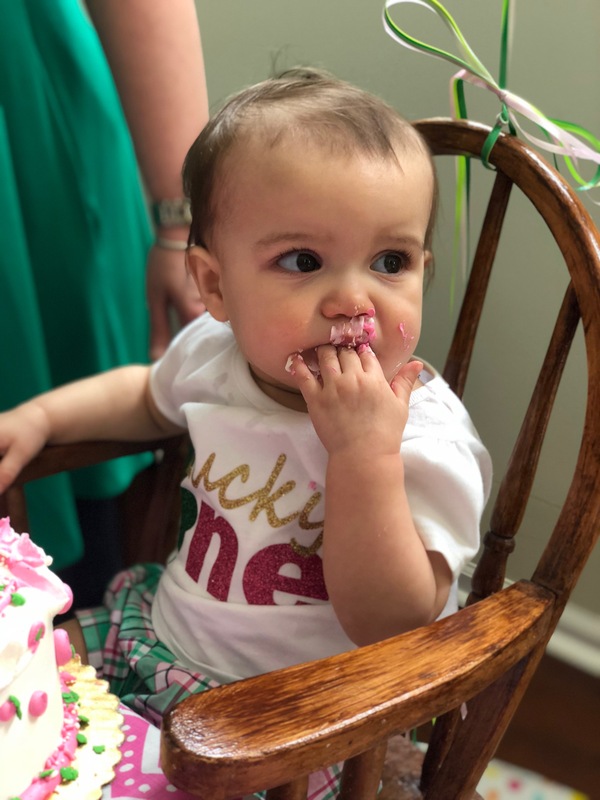 Cake Heaven – This past weekend, we ordered Sloan’s birthday cake. We went into Coccadotts Cake Shop and ordered something that will fit her party theme. Next week I will explain more and publish photos of the cake. But for now, the purpose of this Thursday Rundown topic is to discuss how much fun Sloan had inside the store. As she ran from one side of the counter to the other, leaving her fingerprints all over the glass, she kept saying “birthday cake! birthday cake!” She didn’t really like being told that she would have to be patient until next weekend but I think the wait will be worth it. Sloan got pretty excited in Coccadotts on Sunday. Social@Coastal – A project I had envisioned for a couple years came to fruition last week. 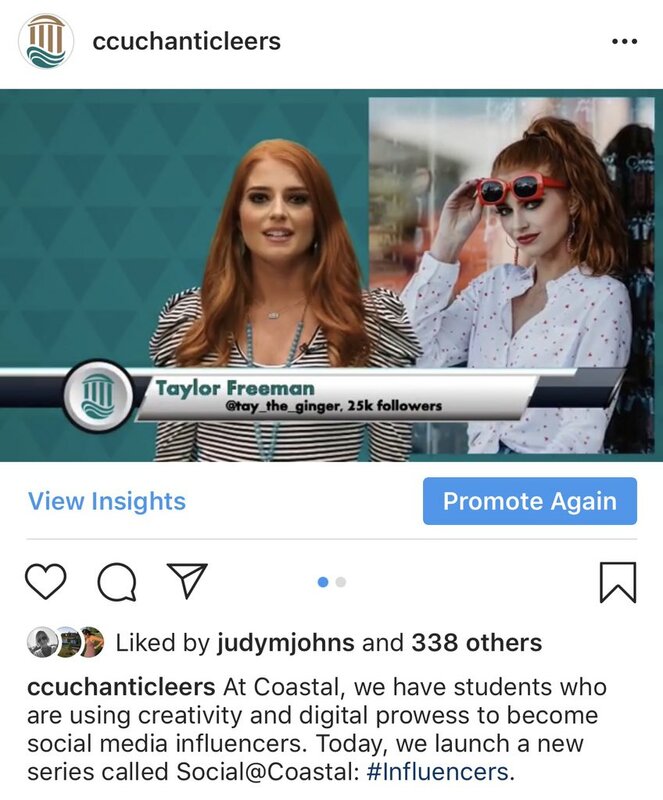 Thanks to the direction of our social media specialist, Anthony Bowser, a spotlight on the student influencers at Coastal Carolina University made its debut on Friday. Called Social@Coastal: #Influencers, this campaign features the social media innovators on campus who have distinguished themselves in the digital world by building large audiences. Senior public health student Taylor Freeman, an Instagram model, led us off. She explained how she achieved influencer status and how CCU helped her along the way. By doing this campaign, it is our hope that we can provide our audience with excellent content on some of our most creative students while also developing relationships with our influencer population. You can view Taylor’s feature by going here. Our Social@Coastal: Influencers campaign made its debut last Friday. He’s Not Here – About 12 months ago, I started going to a different place to get my hair cut. Although I liked the previous place I frequented, it was hard to get an appointment. They say everything happens for a reason! 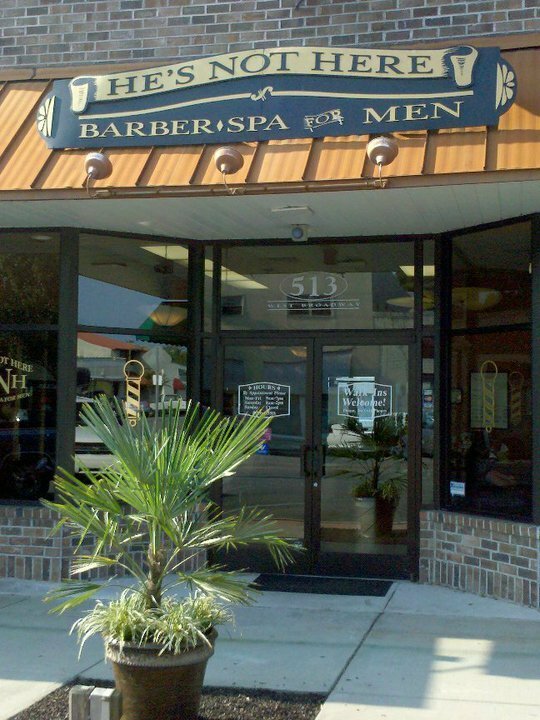 I now go to He’s Not Here, a barbershop just for men. Not only are the cuts great, but you get the full treatment. I am talking a scalp massage, hot towel facial, and straight razor neck finish. I had definitely not experienced something like this in my life until I made the switch a year ago. If you want to treat yourself, try out He’s Not Here on Broadway Street in Myrtle Beach and ask for Chelsea! He’s Not Here is located on Broadway St. in Myrtle Beach (photo courtesy of Yelp). 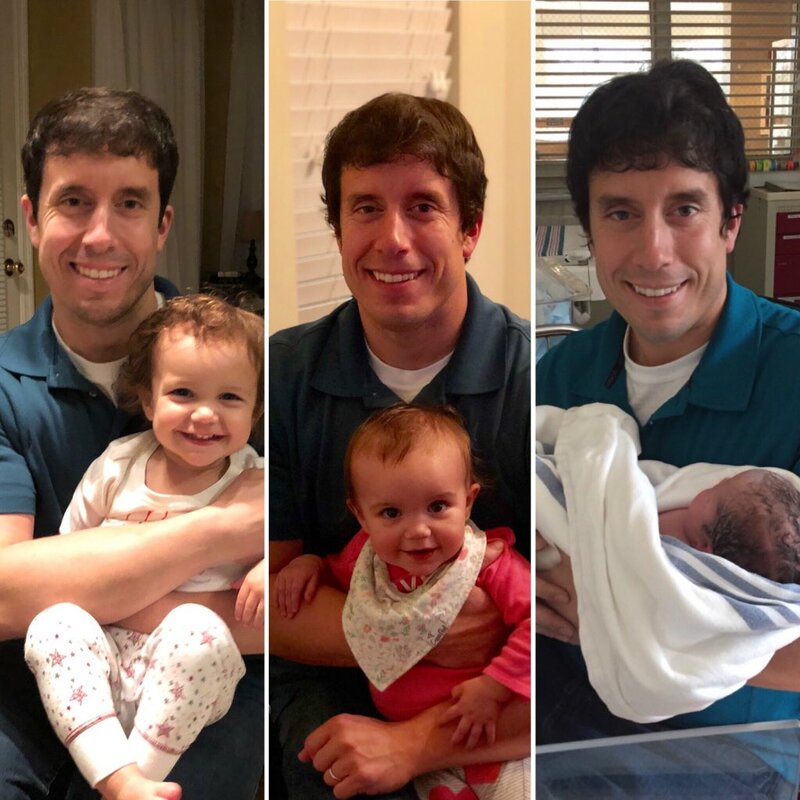 Dear Soon-To-Be First Time Dads… – On this date two years ago, I confessed in a blog post that I had a lot to learn about becoming a dad. Anxious and nervous when writing it, I found comfort as well. How so? I knew that my wife was a baby pro and extremely excited to teach me how to be a great parent. 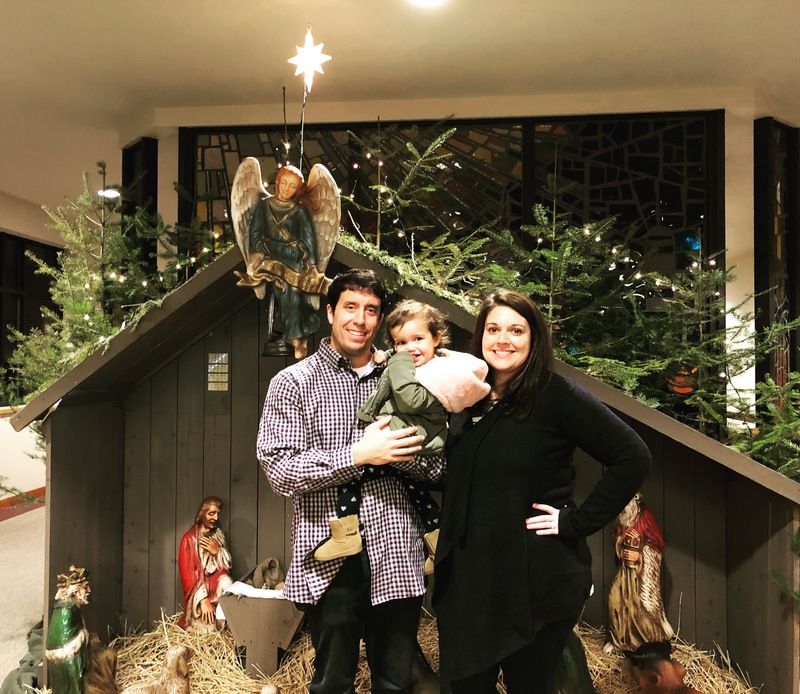 With Sid’s guidance and the love I felt immediately when Sloan was born, the transition from childless to daddy was smoother than what I thought. Ironically, when I wrote this post, I thought I had several weeks until my daughter would come. Not so. I published this post on the eve of when Sidney would go to the hospital and the doctor would make the decision to start the induction process. Sloan would be born less than 72 hours from the blog post going live. Well, I got parents and an almost 2-year-old girl to tend to. When I write next, there won’t be anything “almost” about it. Enjoy your St. Patrick’s Day. Don’t Blink. I don’t usually post in the morning, which is a shame, because mornings are really important. I think we have all had experiences when we wake up and dread getting out of bed. It could be because of fatigue, dark and cold outdoor conditions, stress of the particular day, or a myriad of other factors. We have all been there. But I think if we truly view each day as a gift and the morning as the opportunity to set ourselves up for maximizing its possibilities, we won’t dread our alarms as much. I highly recommend taking advantage of the early morning to complete a self-improvement task before starting your real-life responsibilities. Whether it be going to the gym, reading a book, or working on a blog post, do something to start the day off right. Get the good vibes flowing and improve your chances of making the next 12-15 hours successful. Things are looking up, my friends. We are entering a time of the year when mornings will be more tolerable naturally. The days are getting longer and the weather is getting better. If you are lucky, you might be able to now hear birds chirping. The dark days of winter are starting to transform into the radiant days of early spring. Don’t just seize the day but seize the mornings. As spring approaches, challenge yourself to be motivated in those early hours. Develop a positive routine now so that when the bleaker months come around next year, you will be ready to conquer. Don’t Blink. Three years ago, I scratched something off my bucket list: I judged a macaroni and cheese contest. An inaugural event called the Surf Dreams Foundation Mac-N-Cheese Cookoff was trying to make some noise in the community and I wanted to get involved. I participated in a social media contest and won a coveted role as one of the judges. I had a great time. Sid and I at the inaugural Surf Dreams Foundation Mac-N-Cheese Cookoff in 2016. After you do something as prestigious as help declare a winner in a macaroni and cheese competition, you can’t do much to top it. So, I stayed away from the 2nd and 3rd annual Surf Dreams Foundation Mac-N-Cheese Cookoffs. I figured allowing a few years to pass was a good thing before showing up again. Just a couple days shy of the three-year anniversary of when I realized my macaroni and cheese fantasy, I returned to the festival. This time around it wasn’t an inaugural event. Instead, it was a much bigger and better organized event with numerous area restaurants participating. In fact, the 4th Annual Mac-N-Cheese Cookoff had grown so much that we had to be shuttled to the event site. 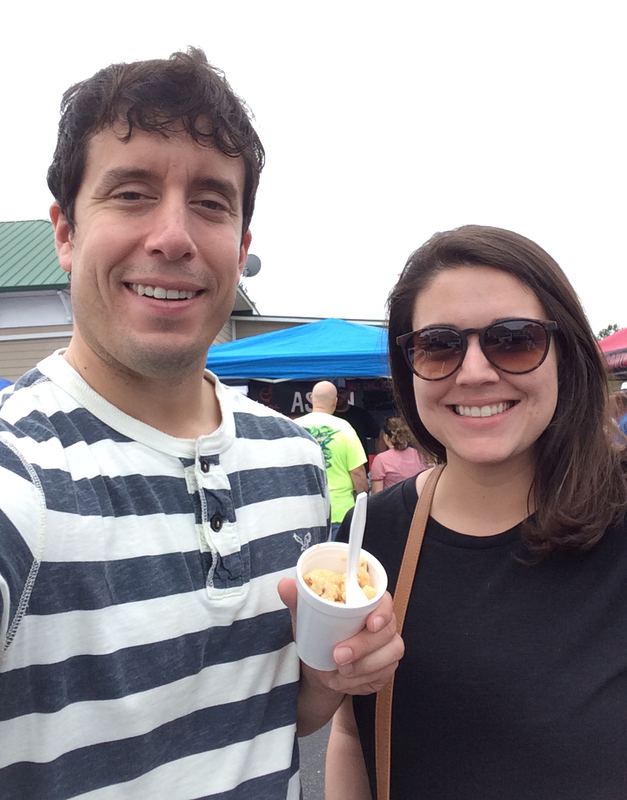 Sidney and I returned to the Mac-N-Cheese Cookoff on Sunday. But the cookoff wasn’t the only thing that had grown; my entourage had too. 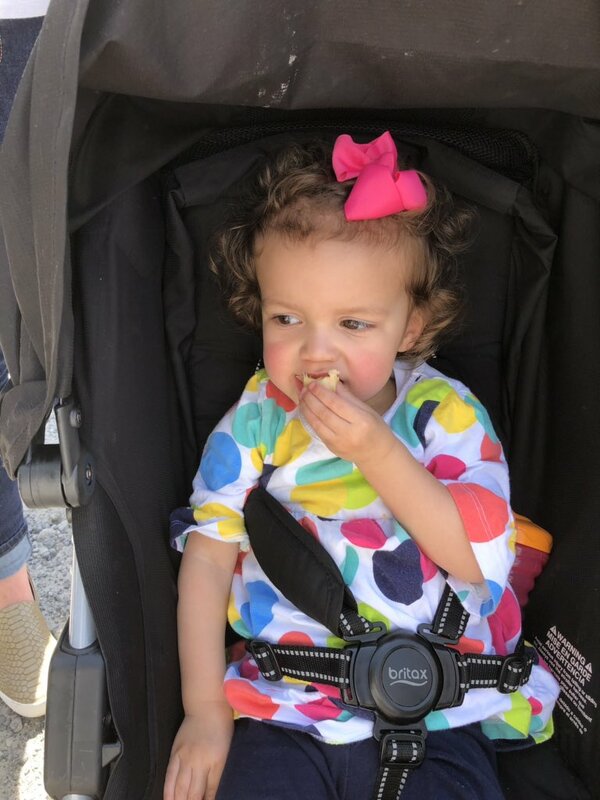 Sloan joined us on Sunday to eat some mac and cheese in the sun. 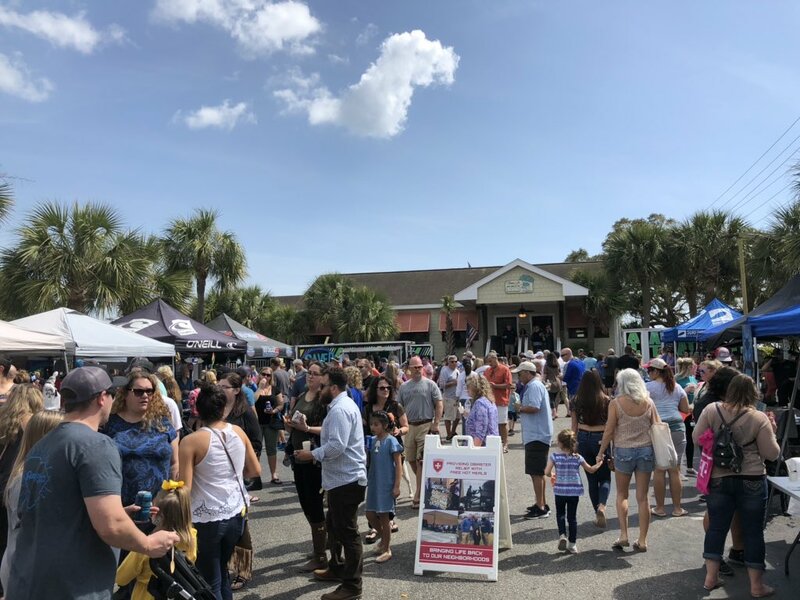 This year the festival was on the premises of Sara J’s Seafood Restaurant and we wasted no time purchasing sample tickets. Before we knew it, we were chowing down on different versions of my favorite dish. Many of the macaroni and cheese dishes had some type of meat served with it. Whether it be chicken, chorizo, or ground beef, you could fill up on protein with your carbs. Multiple restaurants/vendors presented their mac and cheese offerings with fresh seafood. As someone who doesn’t enjoy most fish and crab, I saved my tickets when we passed those booths. 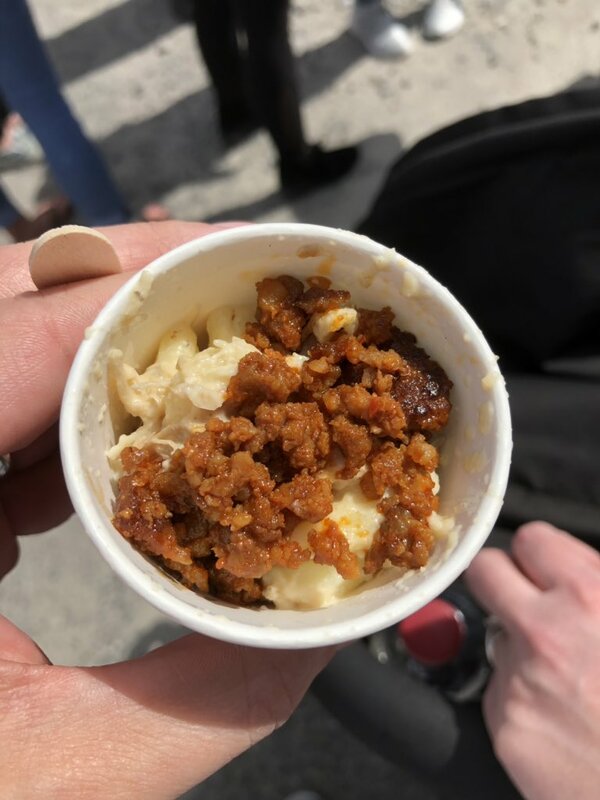 Many of the macaroni and cheeses at the cookoff came with meat mixed in. This sample that I enjoyed was topped with chorizo. But there was also homage paid to classic mac and cheese as well. 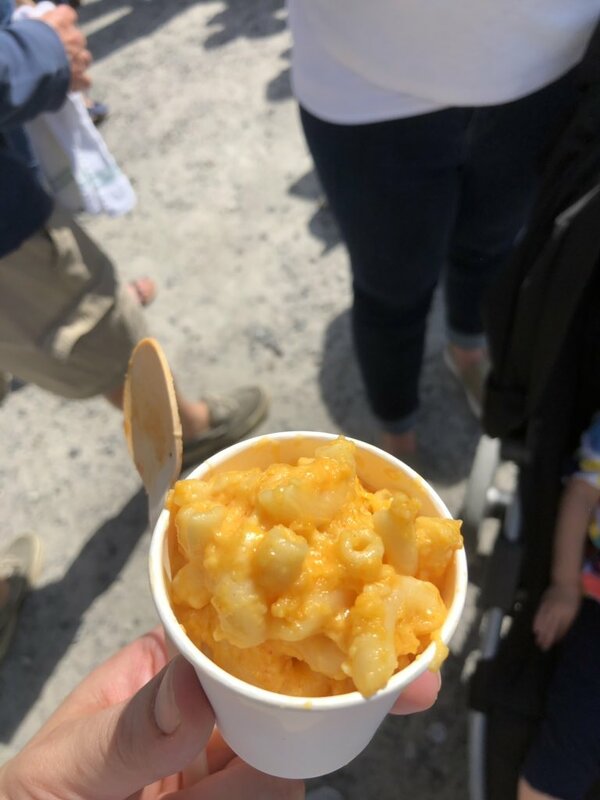 At one booth, the woman doing the serving said “This is simply macaroni and cheese just like your grandma made it.” I appreciated the many vendors who opted for the basic ingredients of noodles, cheese, butter, and lots of love. The cookoff also offered good old fashioned macaroni and cheese made like your grandma made it. This year’s cookoff evolved to include mac and cheese dishes not meant to be served in a cup with a fork. One such example was the macaroni and cheese pizza offered by Mellow Mushroom. This wasn’t a gimmick offered by a $5 buffet place. Rather, it was gourmet pizza at its finest. In hindsight, Sid and I wished we each got our own piece because it was the best thing we tried all afternoon. The macaroni and cheese pizza from Mellow Mushroom was incredible! Probably our favorite. 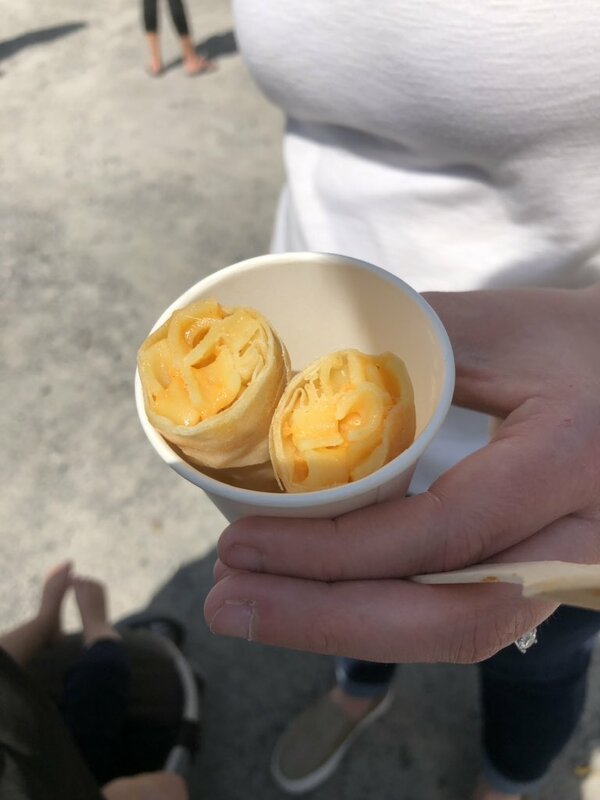 We also had the pleasure of sampling mac and cheese spring rolls. These little guys were incredible and Sloan liked them too! They came from a food truck that specialized only in spring rolls. 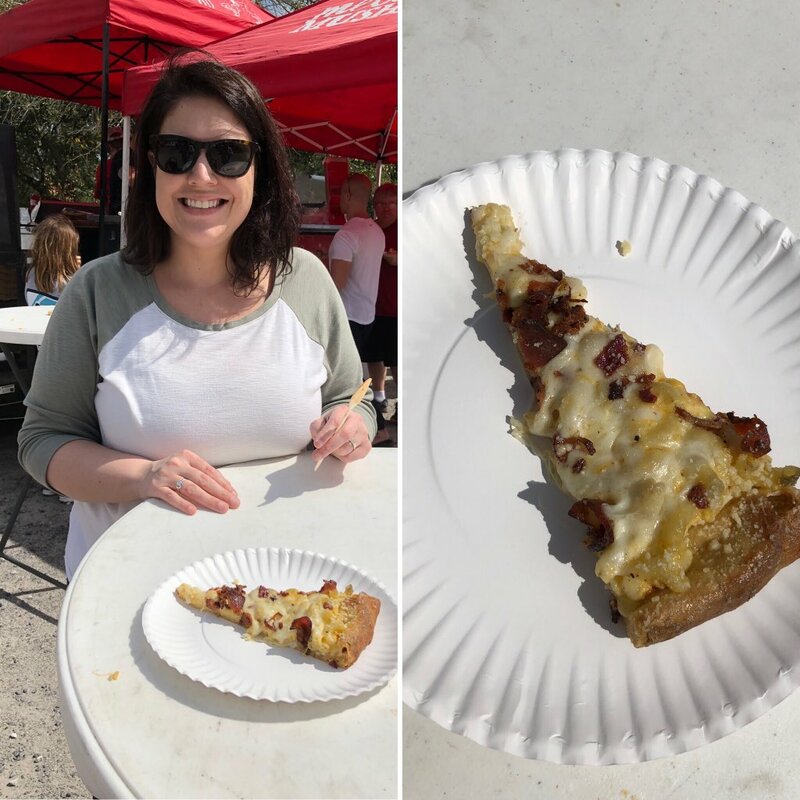 So, in addition to the obvious flavor, the vendor also offered spring roll options such as bacon cheeseburger, pizza, hot dog, taco, pulled pork, and even dessert options. The mac and cheese spring rolls were awesome! In my opinion, the story of our visit to Garden City wasn’t the mac and cheese pizza or the spring roll food truck – it was what I alluded to above. To see the strides made by the event was neat. My worries were unfounded that the lack of my judging expertise would negatively impact the young festival. Dumb joke, I know. Sloan loved the Mac-N-Cheese Cookoff! This is her nibbling on a macaroni and cheese spring roll. In all seriousness, congrats to the Surf Dreams Foundation Mac-N-Cheese Cookoff organizers for putting together a great event. My family had a nice time. Don’t Blink.